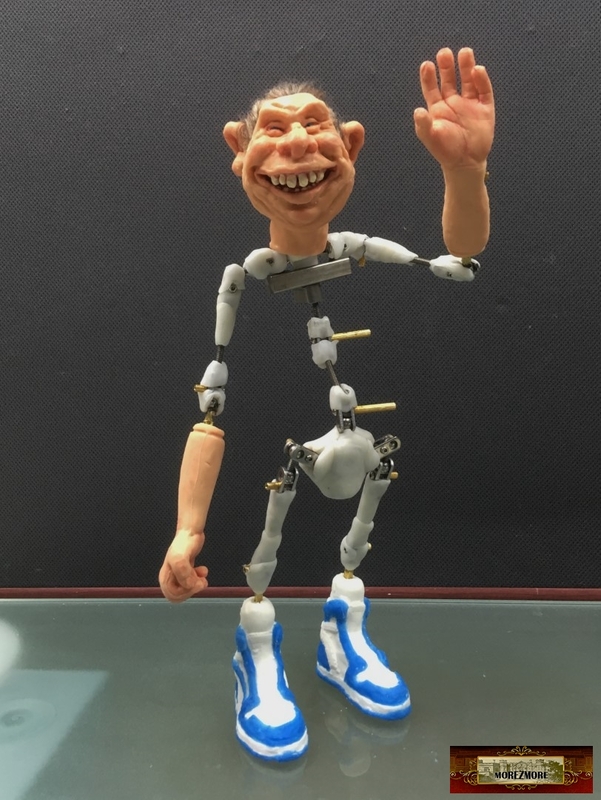 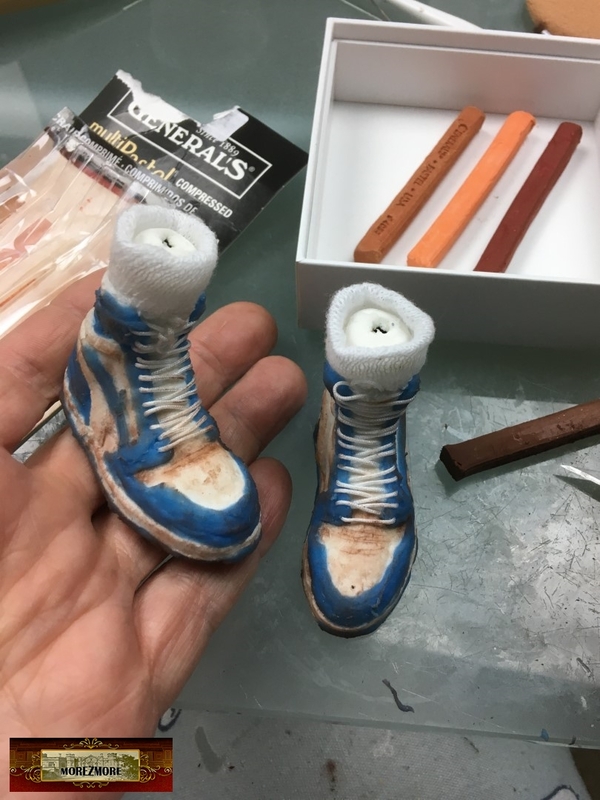 Nikolai’s feet (as well as hands) are a little larger than 1:6 scale, because he is a troll. 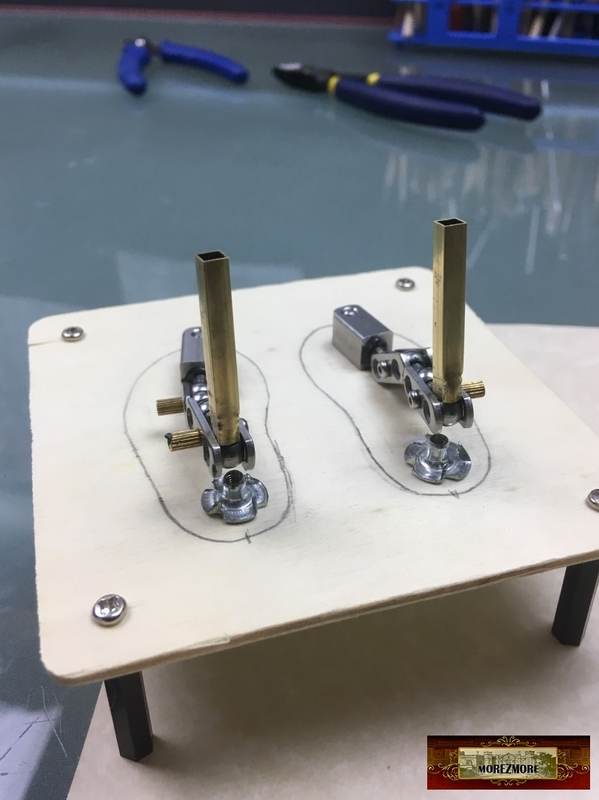 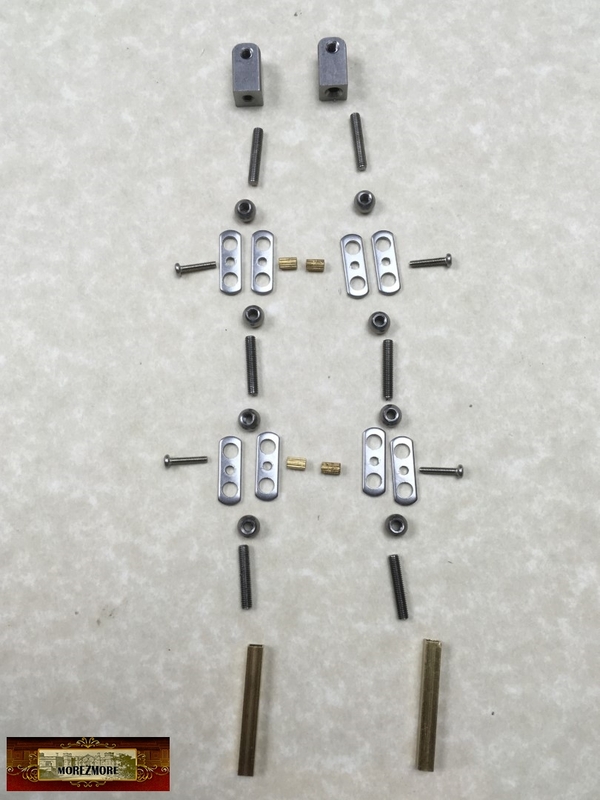 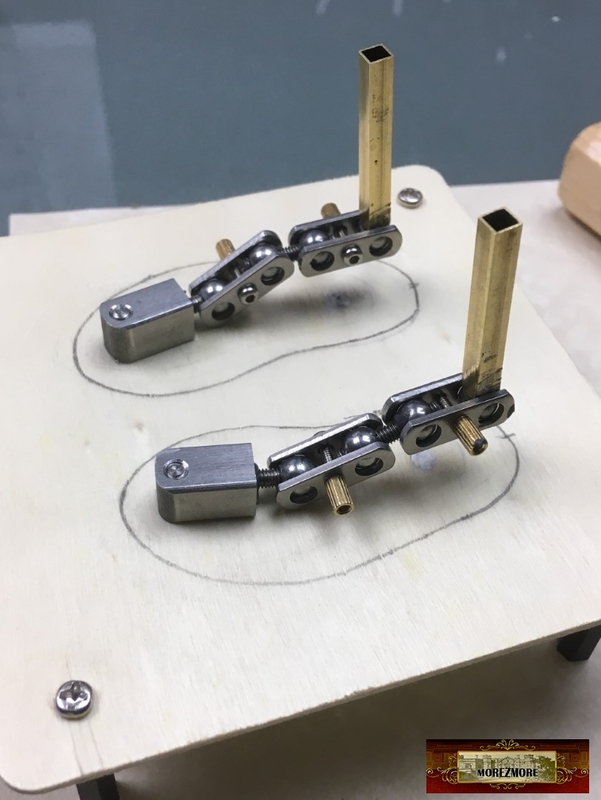 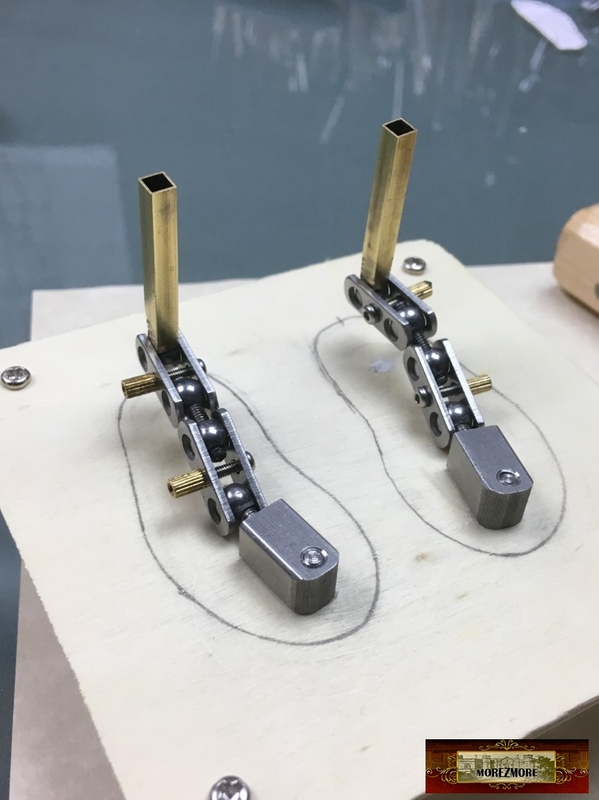 In order to have the tie down threaded holes in the right places I had to add one more joint to each foot. 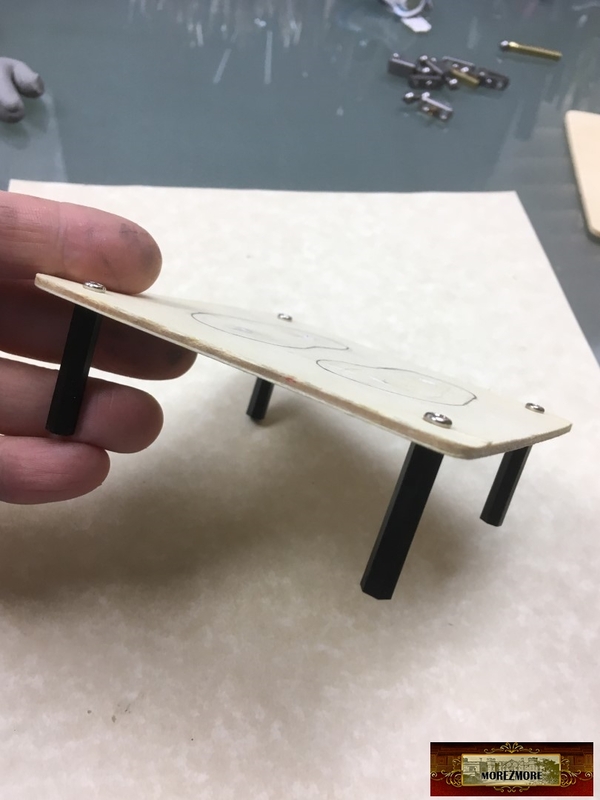 To test them, I made a small tie-down stage. 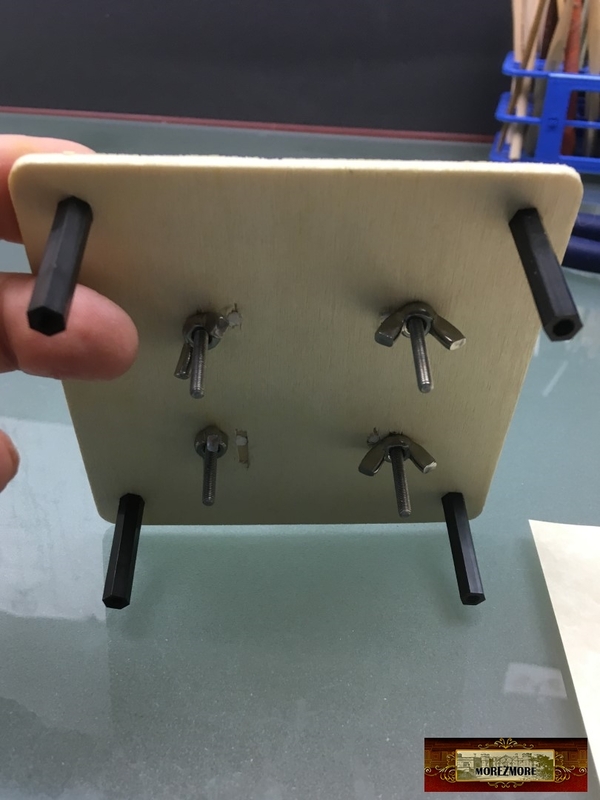 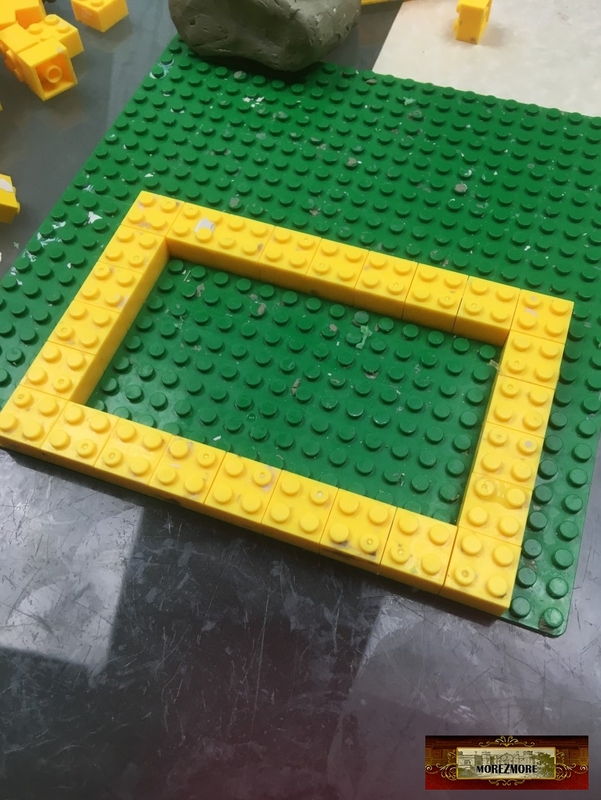 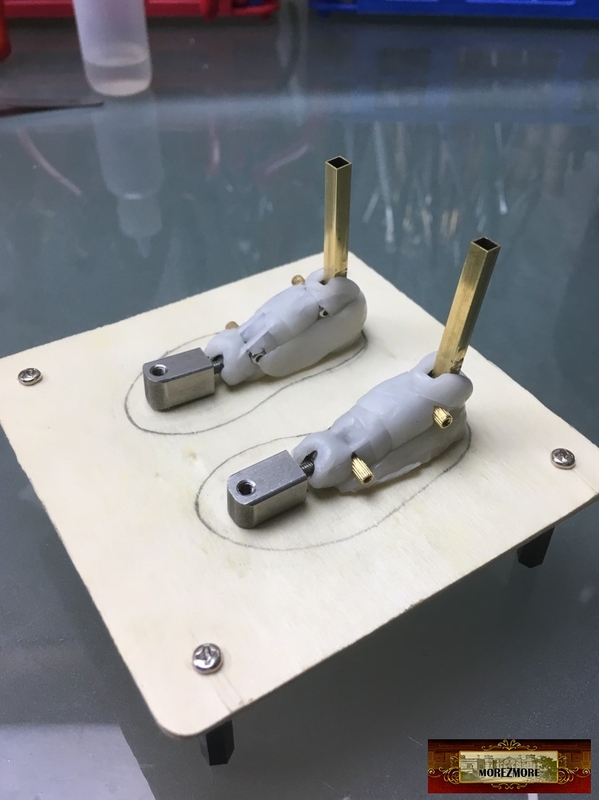 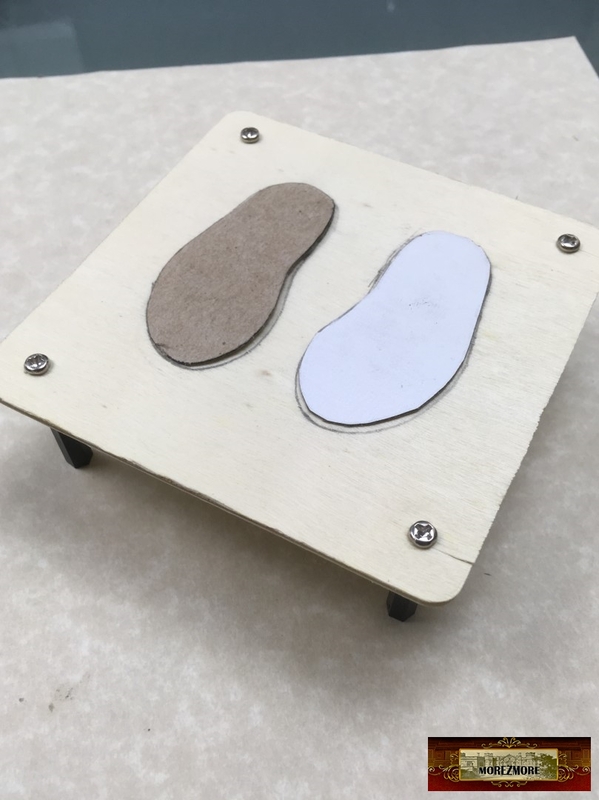 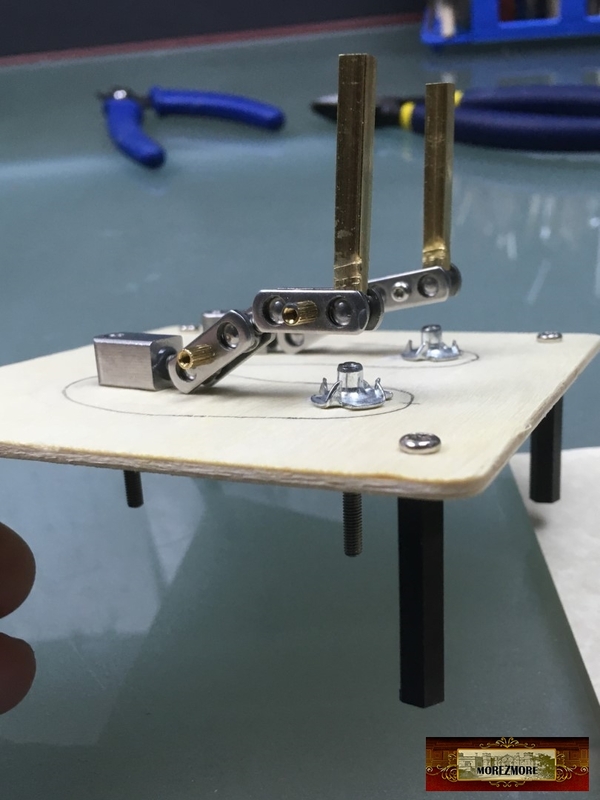 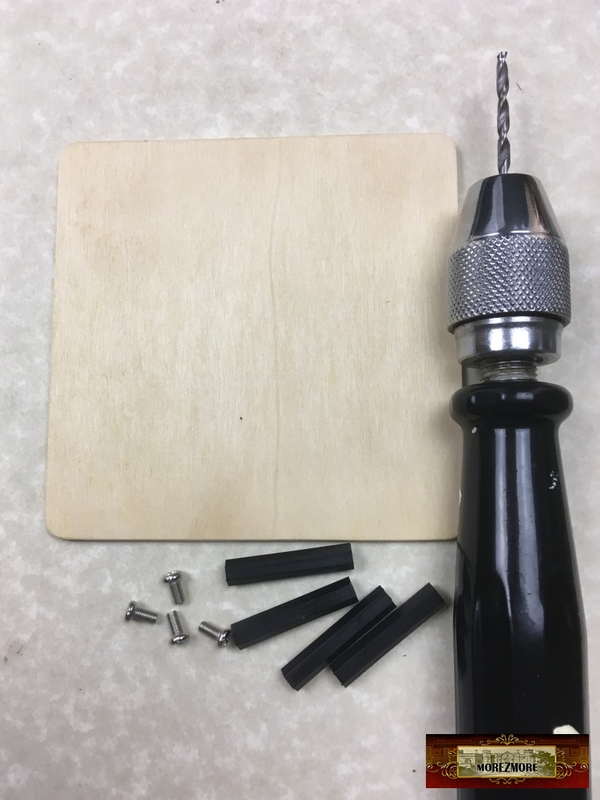 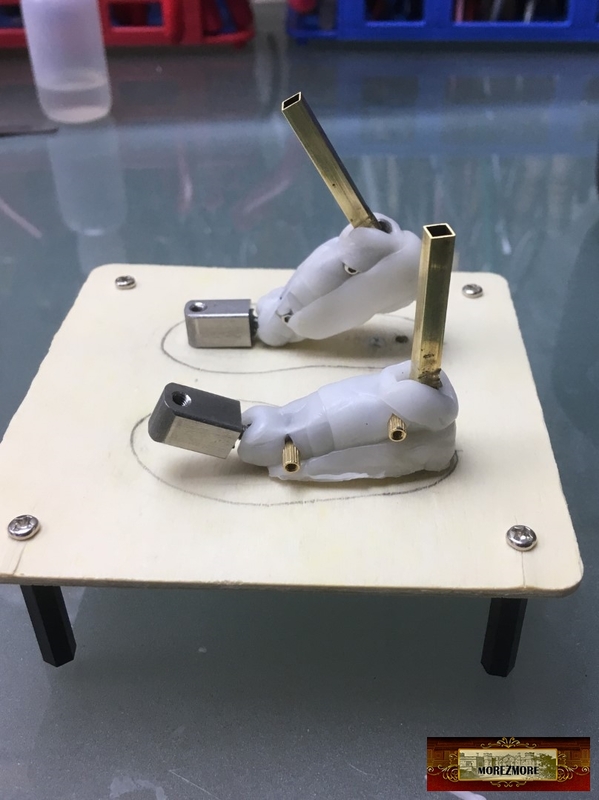 wood square cutout, M3 screws, nylon standoff connectors . 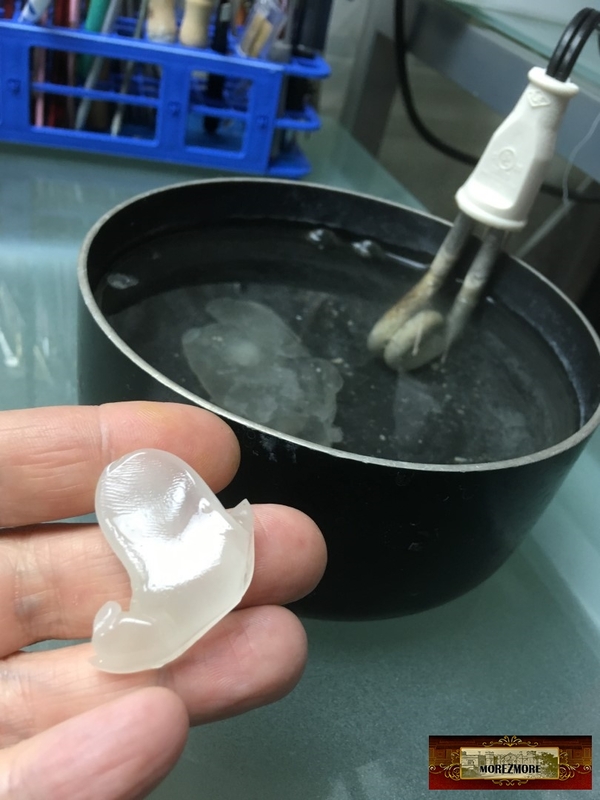 Instamorph Moldable ThermoPlastic (more information how to use it can be found here (towards the bottom). 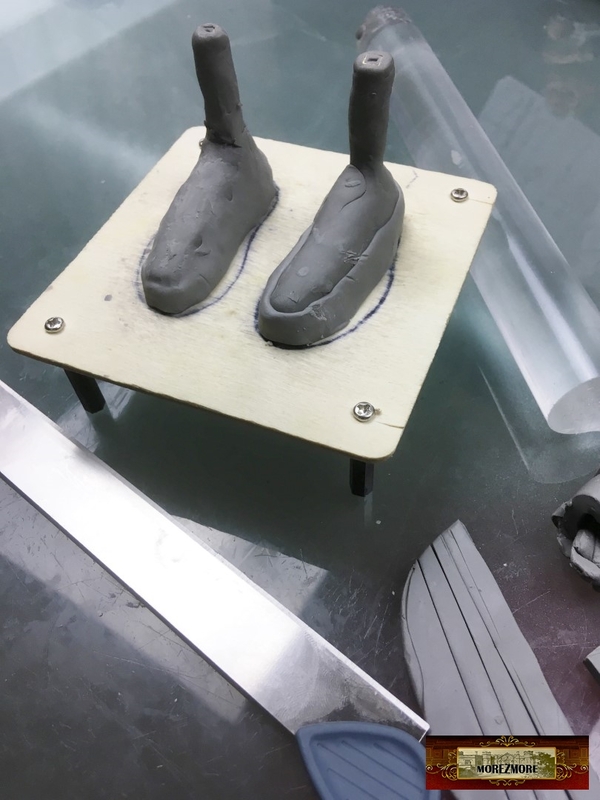 Starting the clay prototype for the mold. 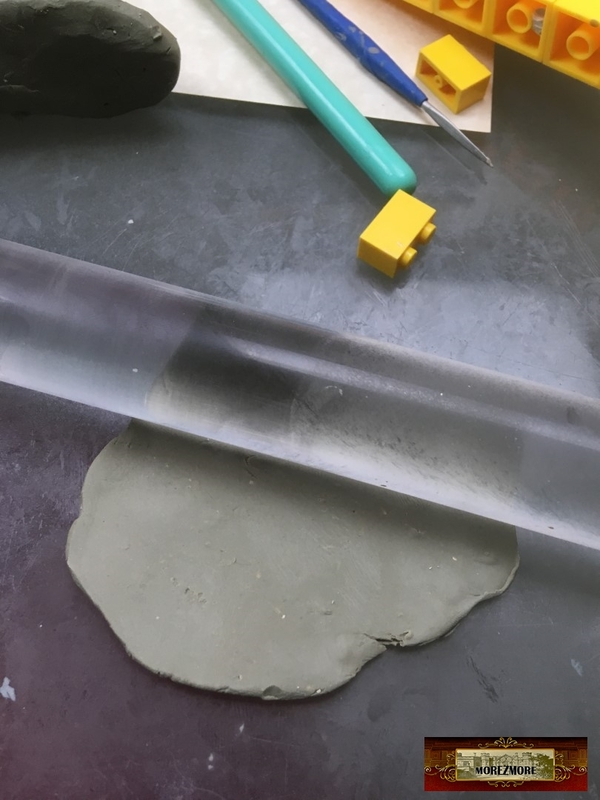 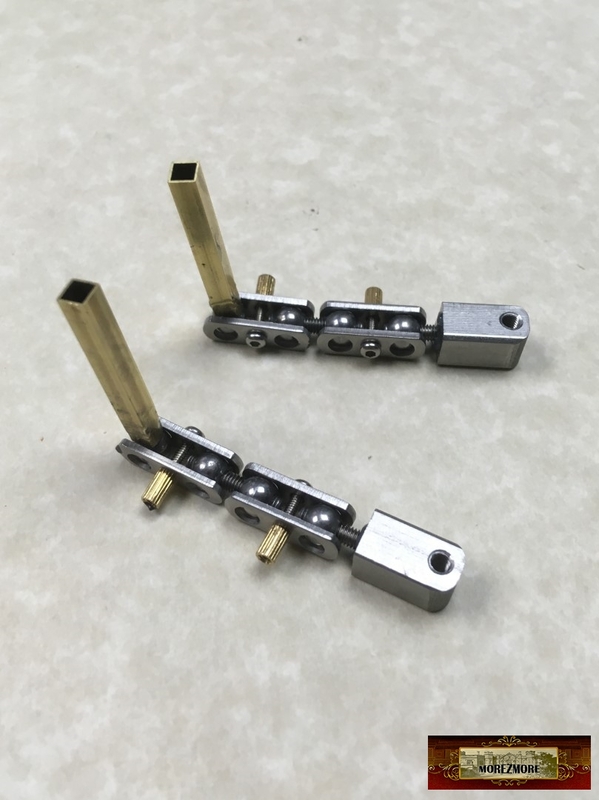 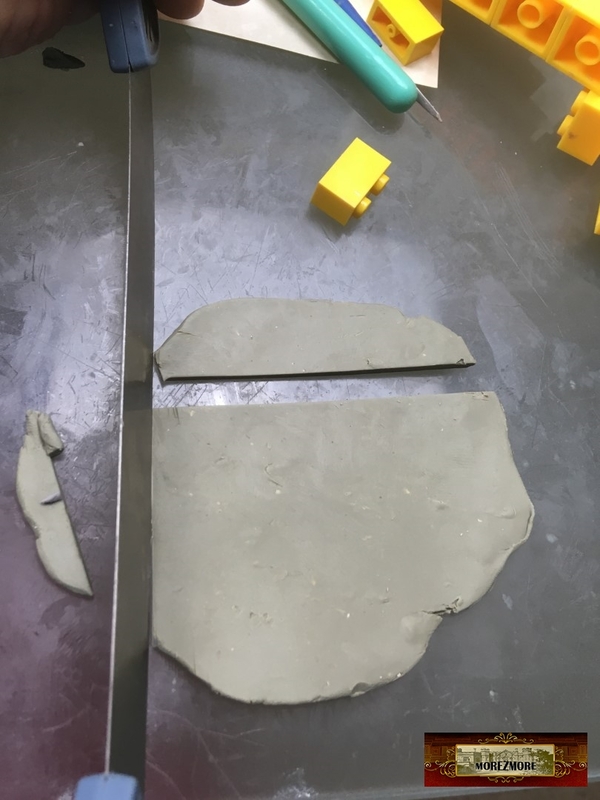 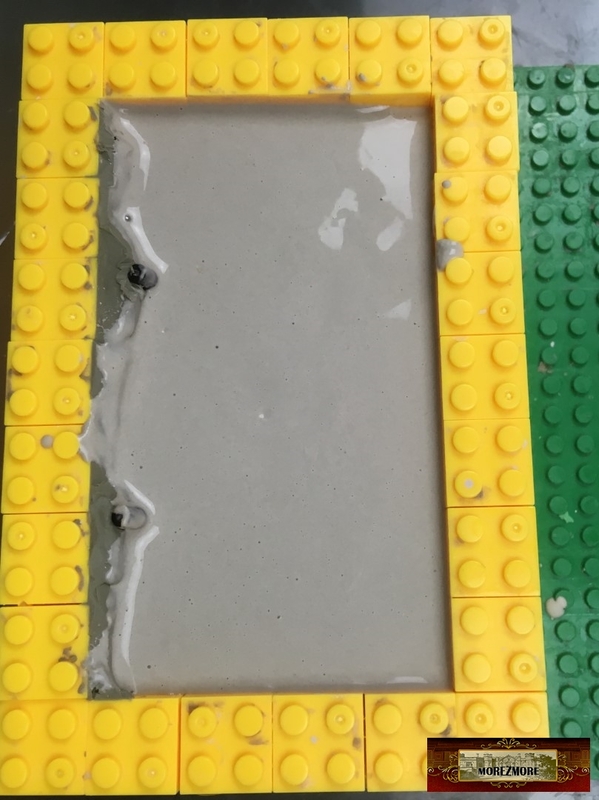 clay roller and blade to make thin layers of clay to gradually build to the needed shape. 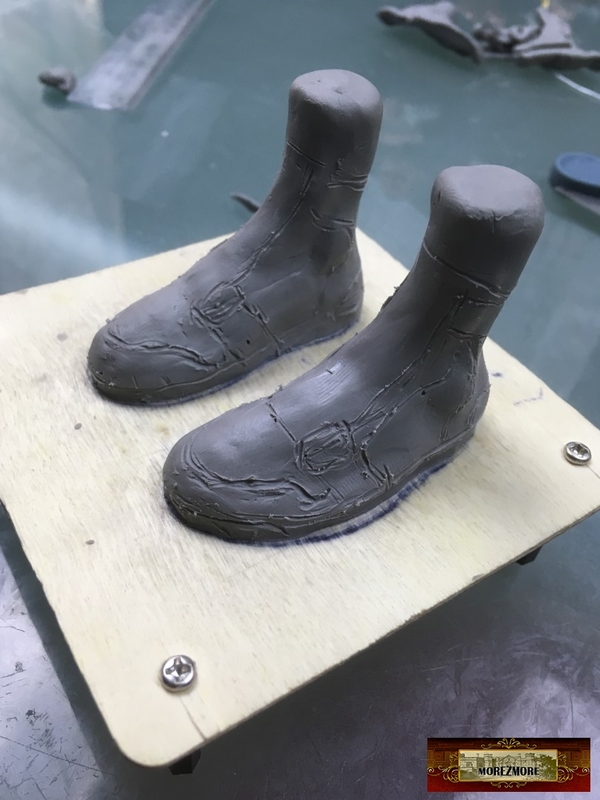 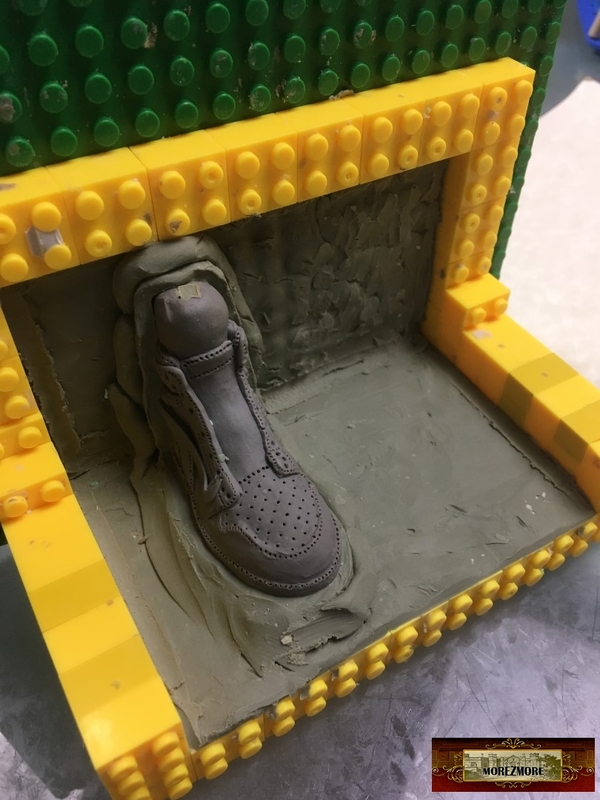 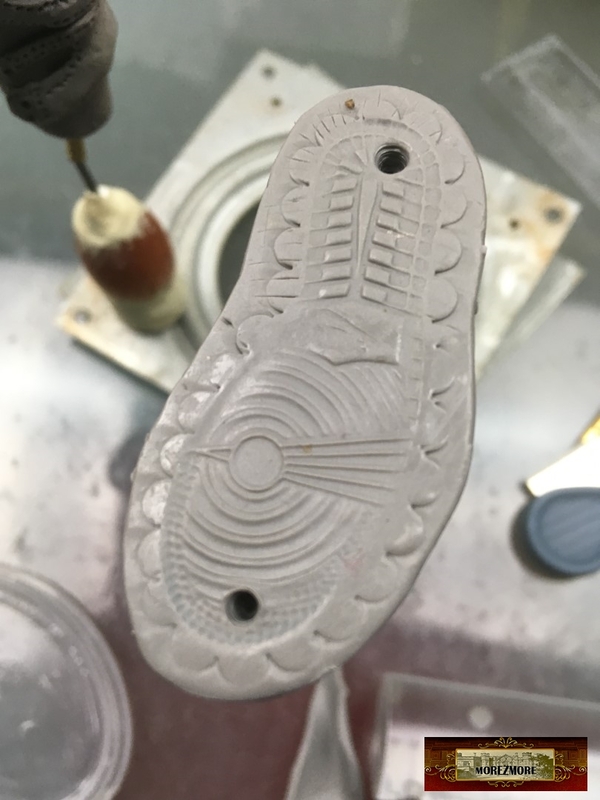 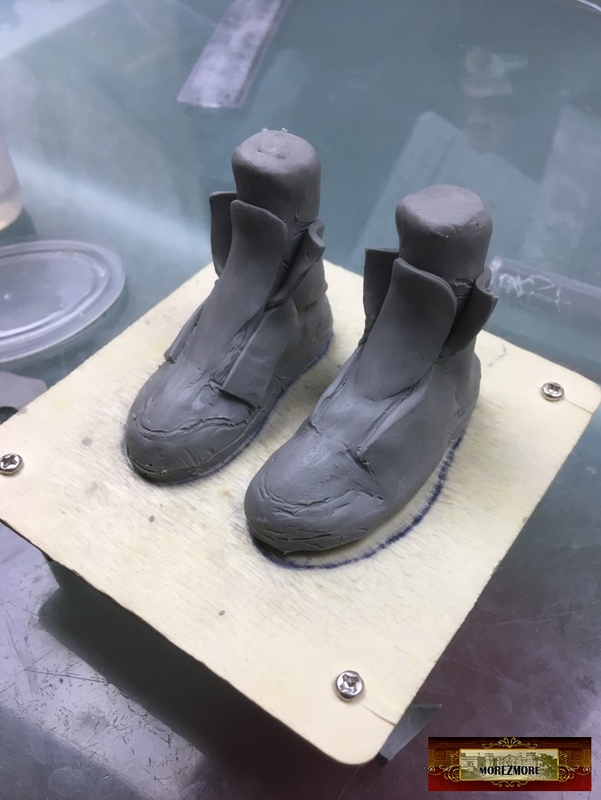 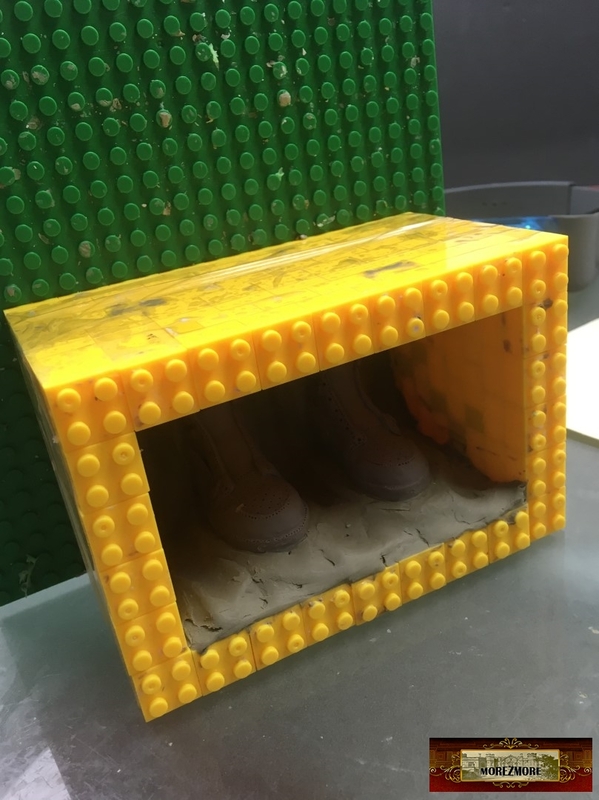 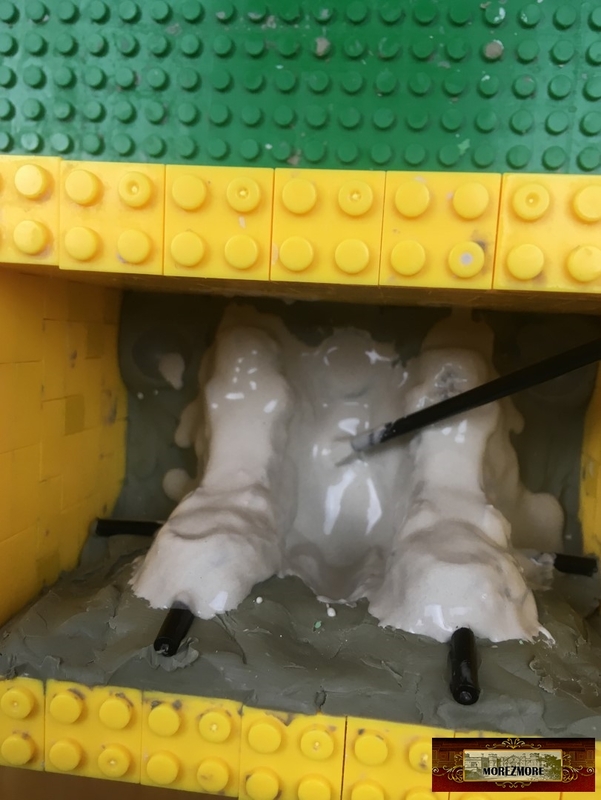 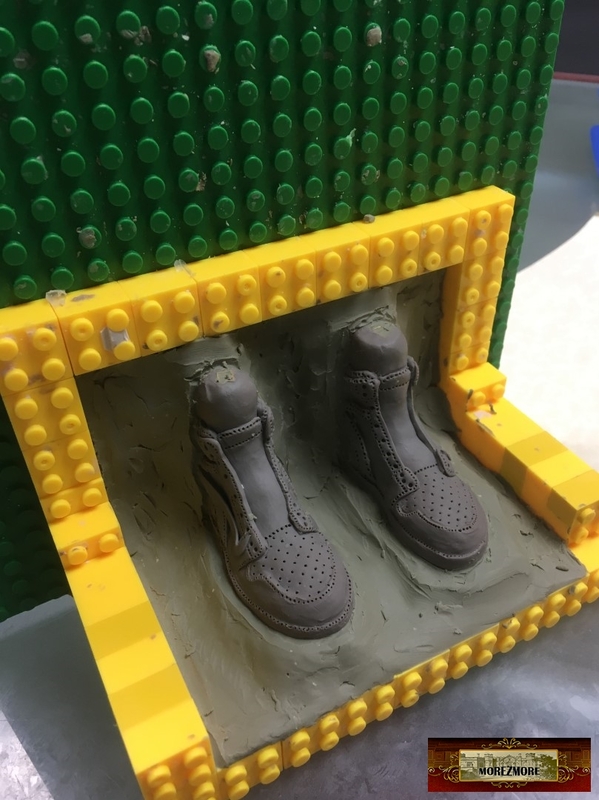 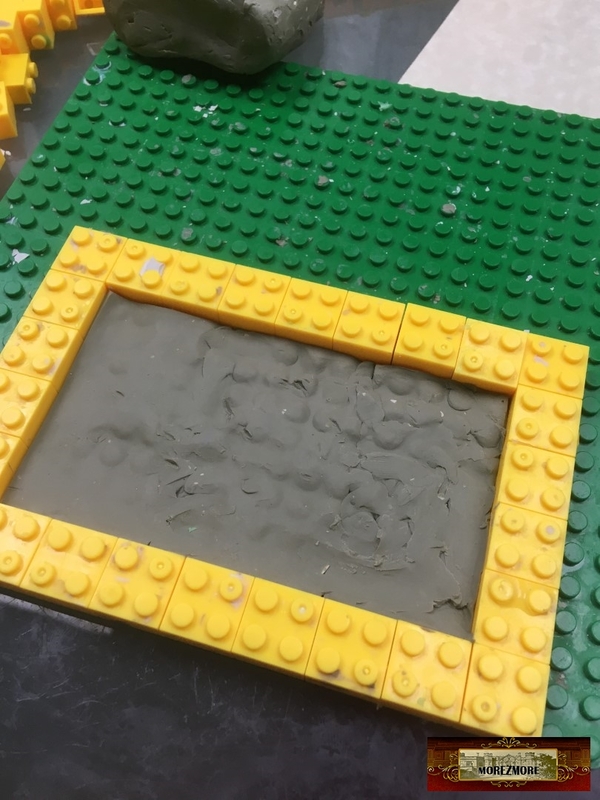 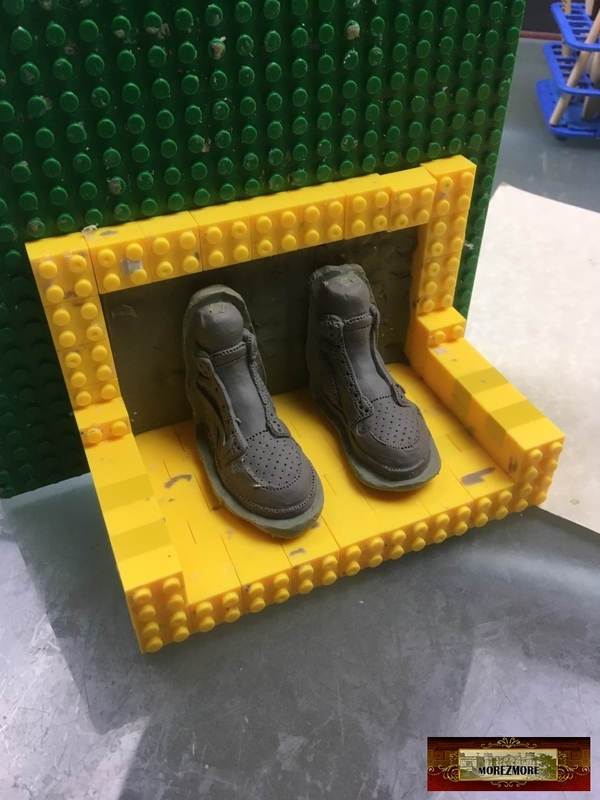 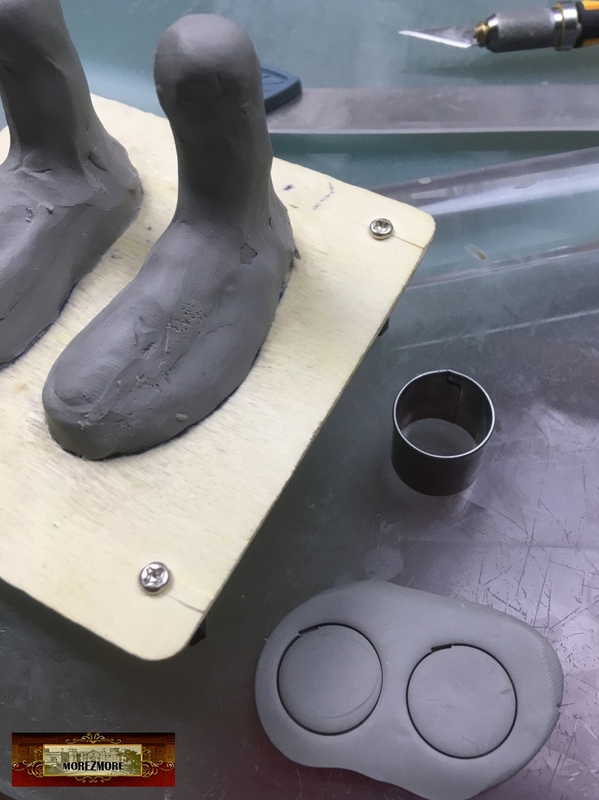 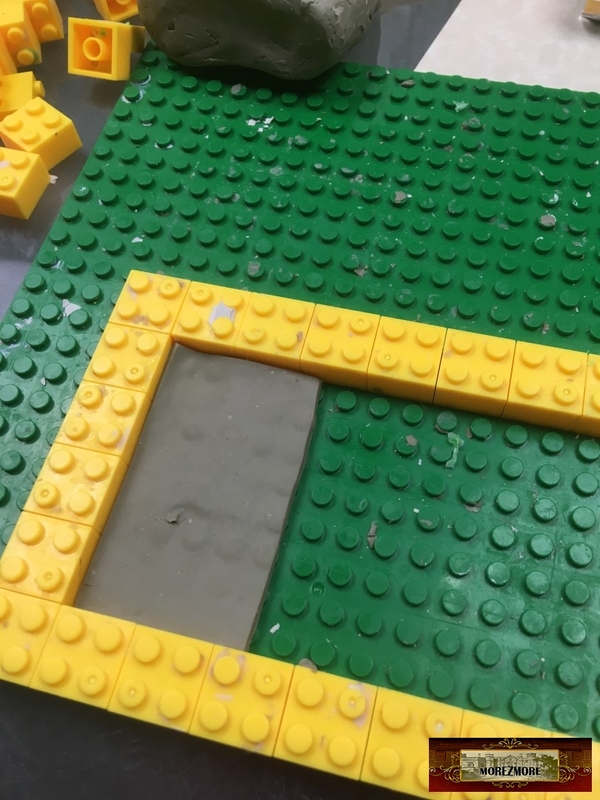 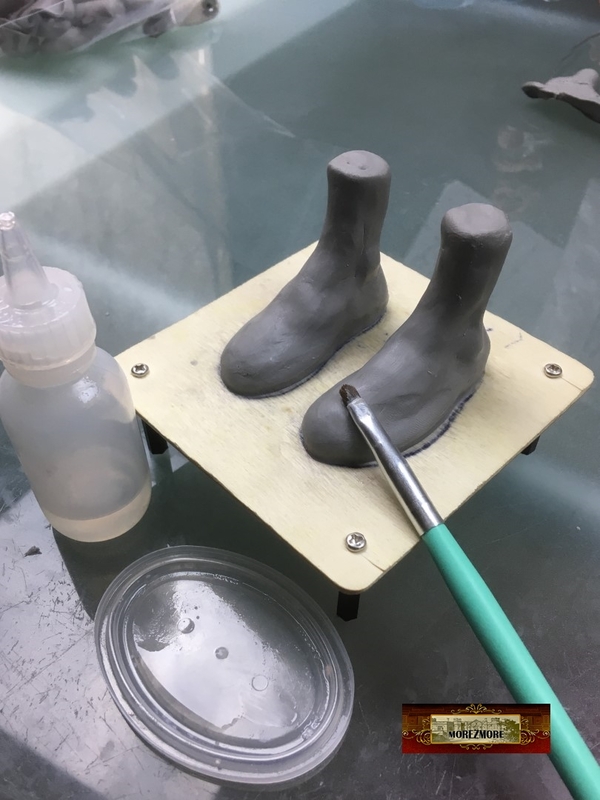 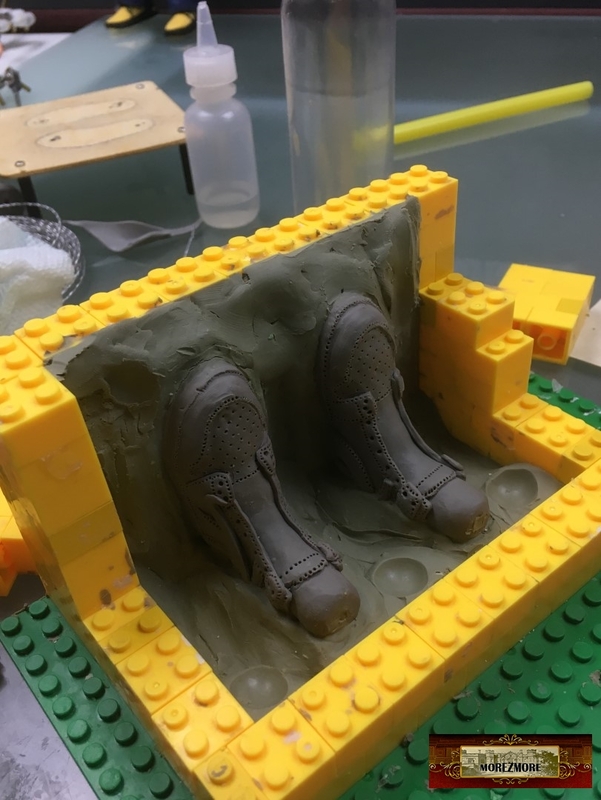 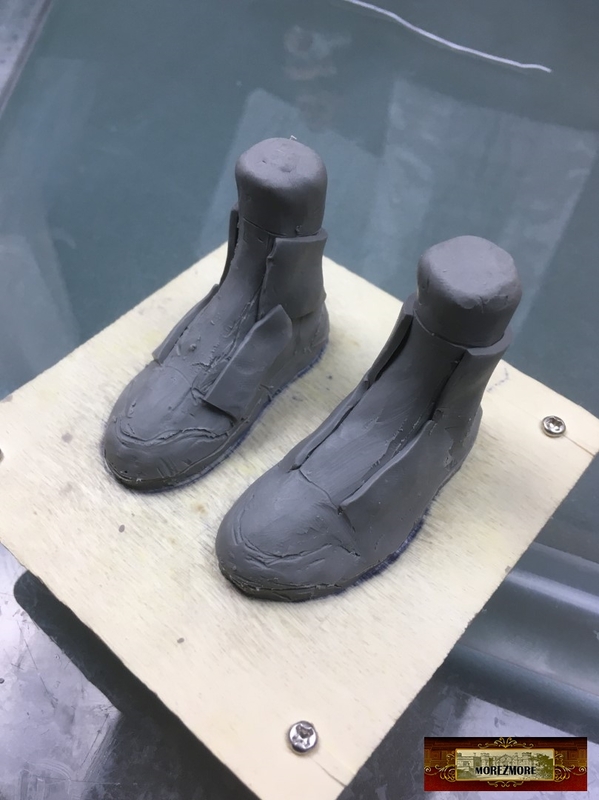 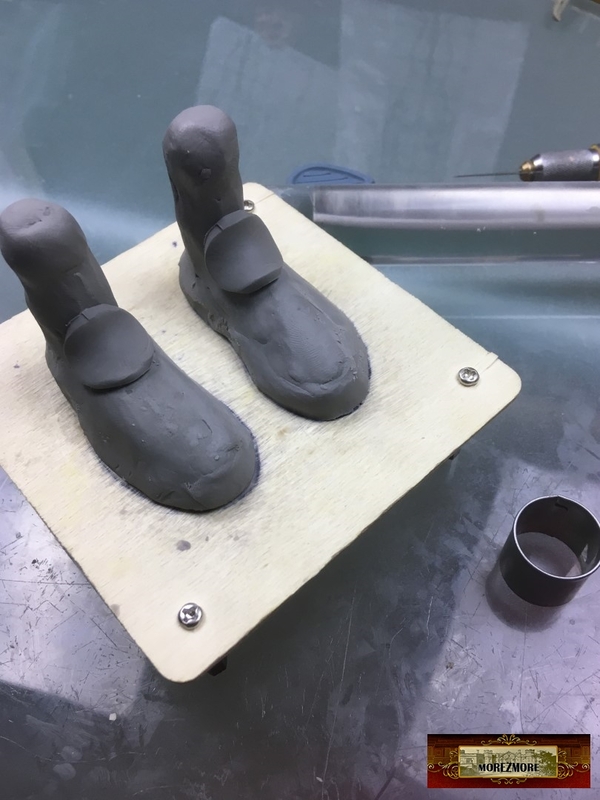 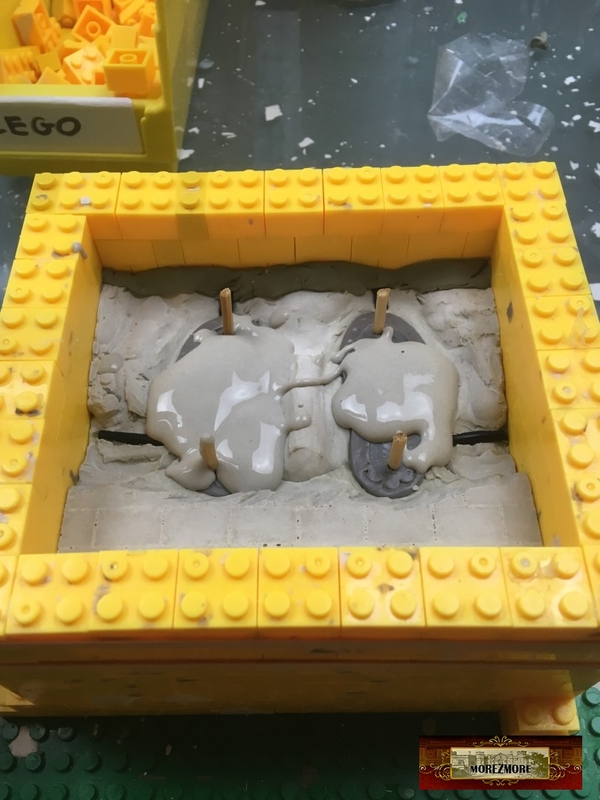 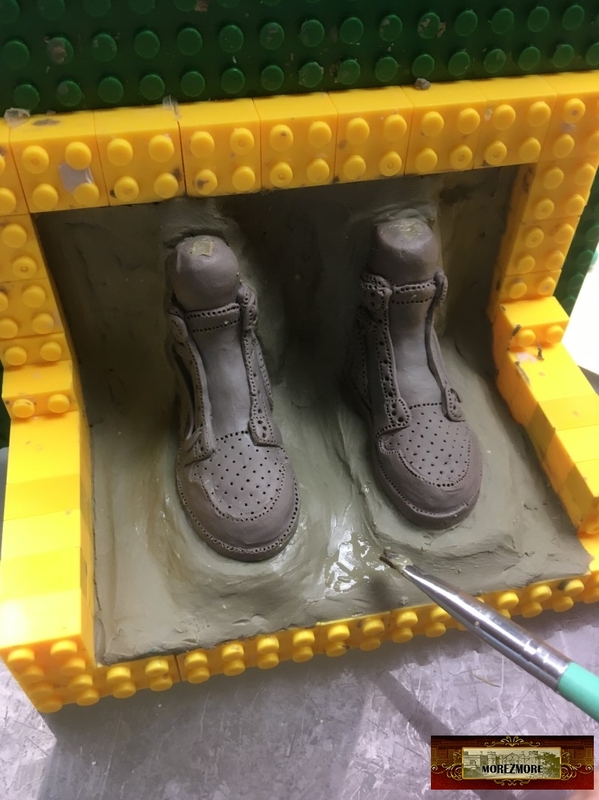 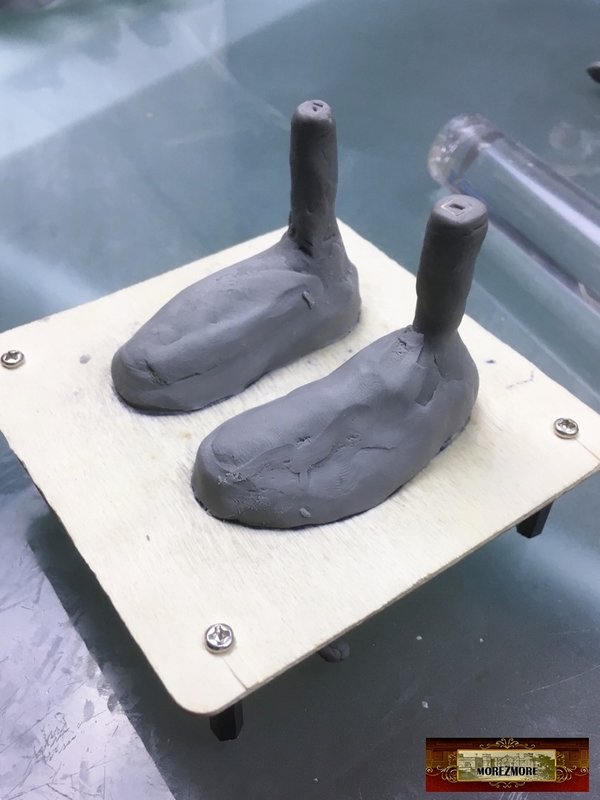 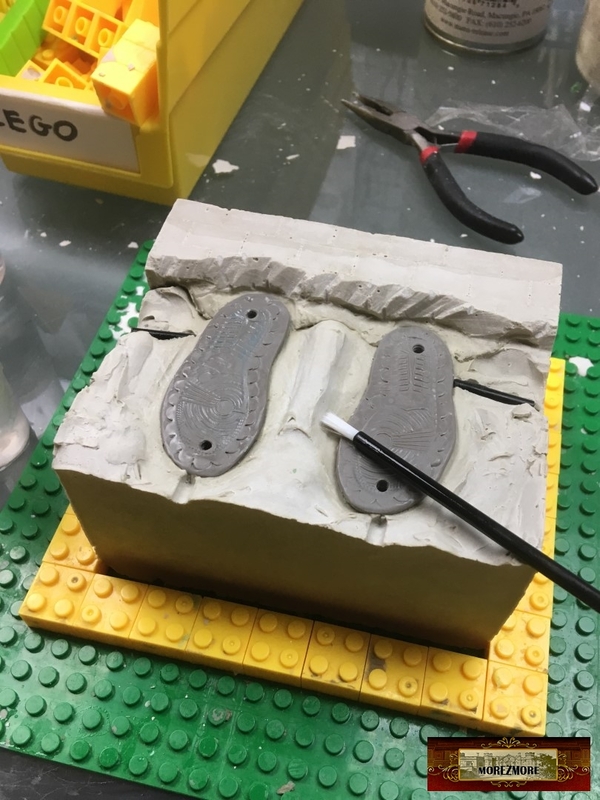 Next – making the mold. 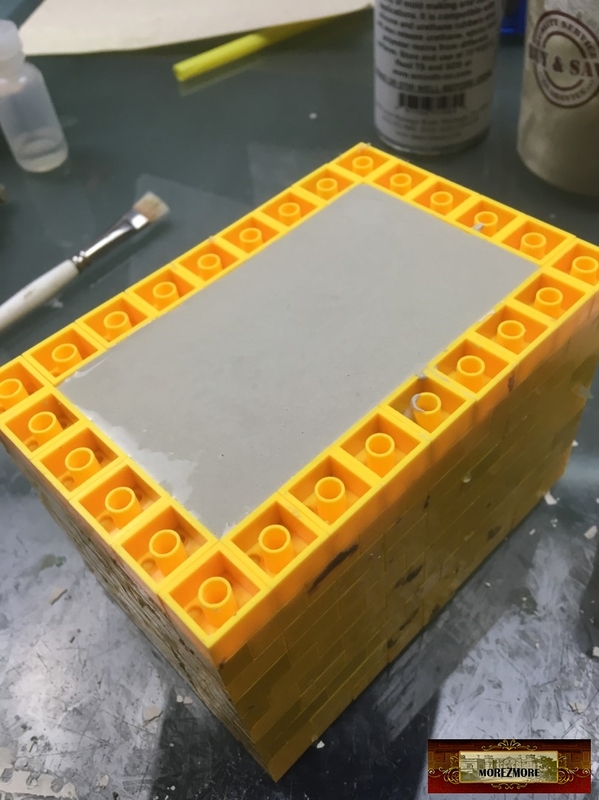 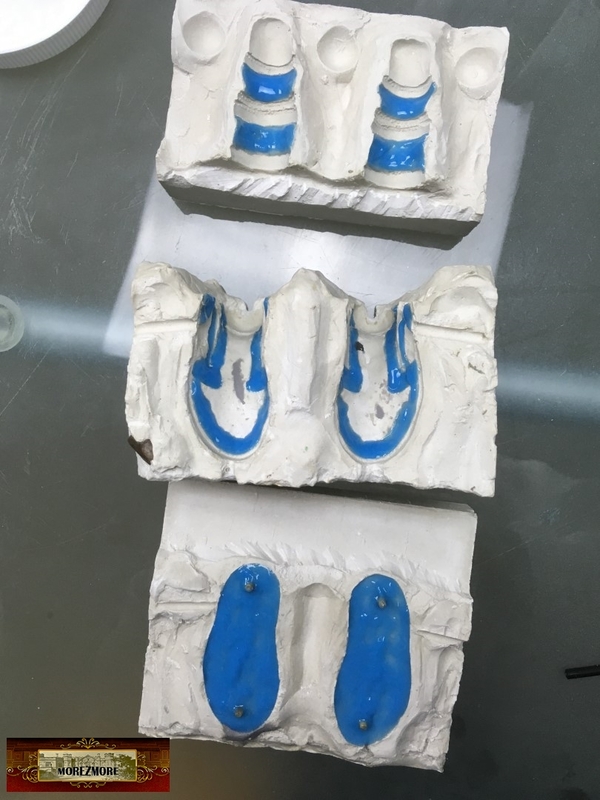 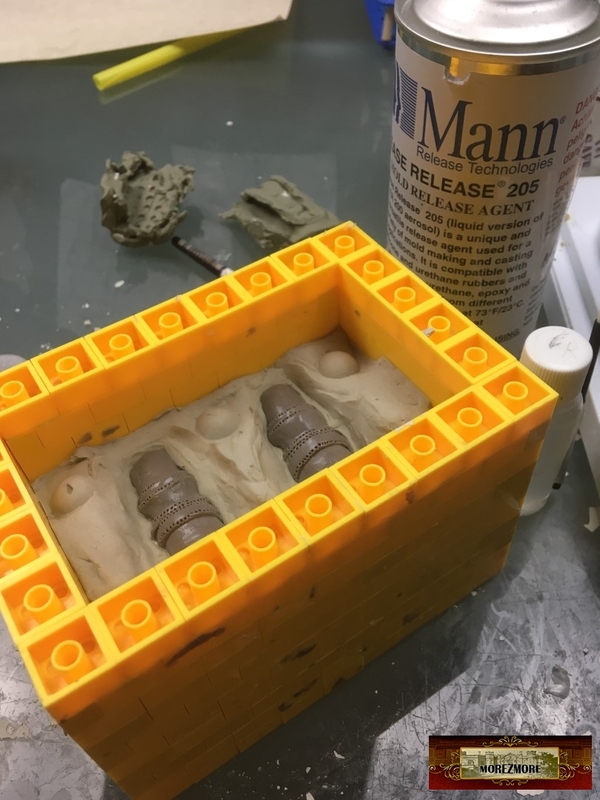 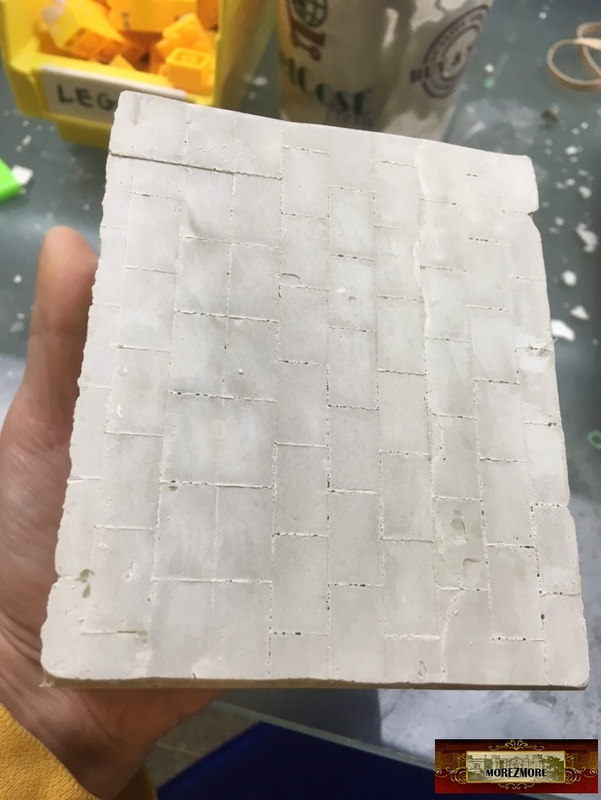 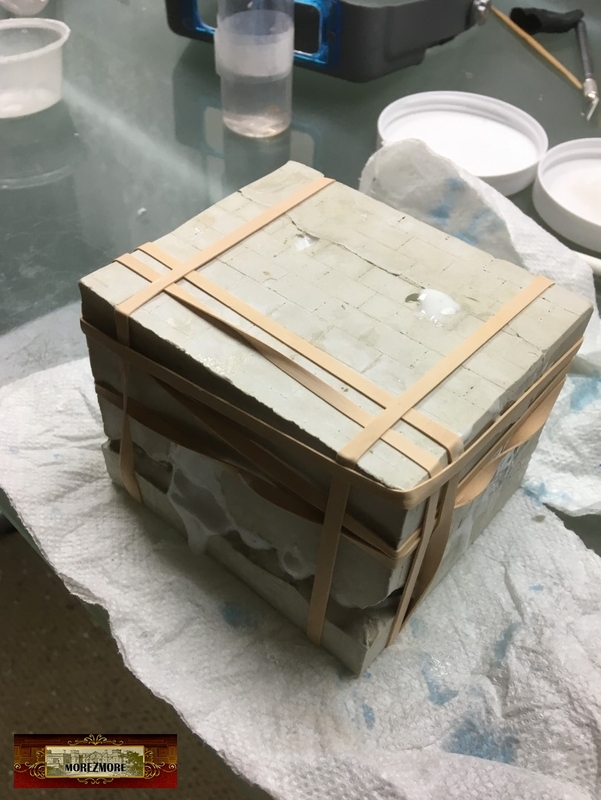 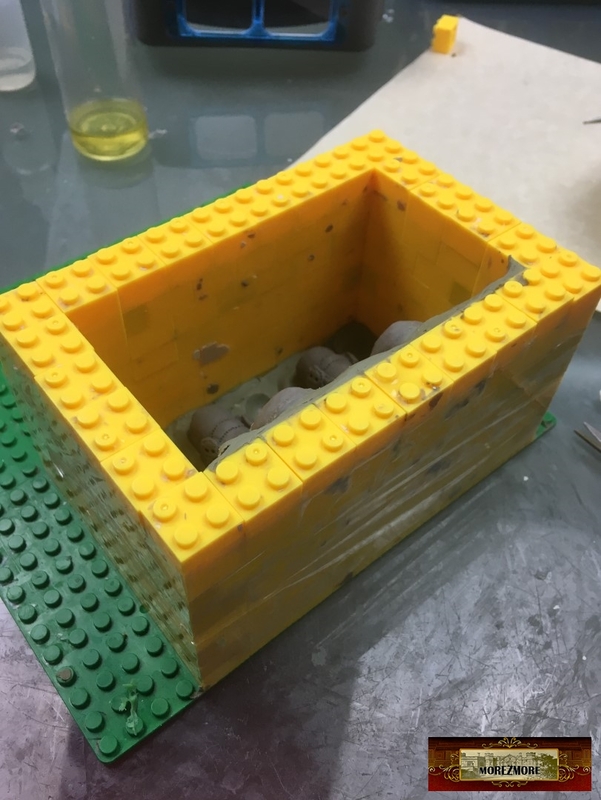 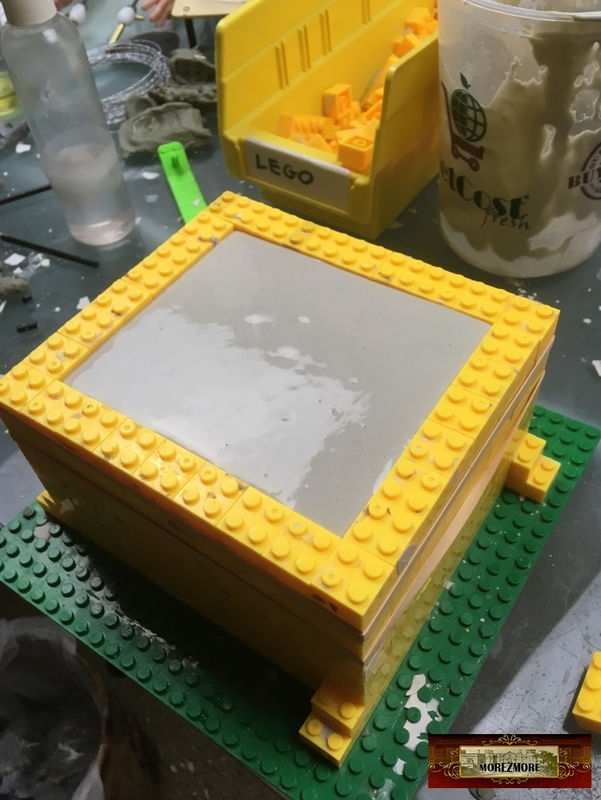 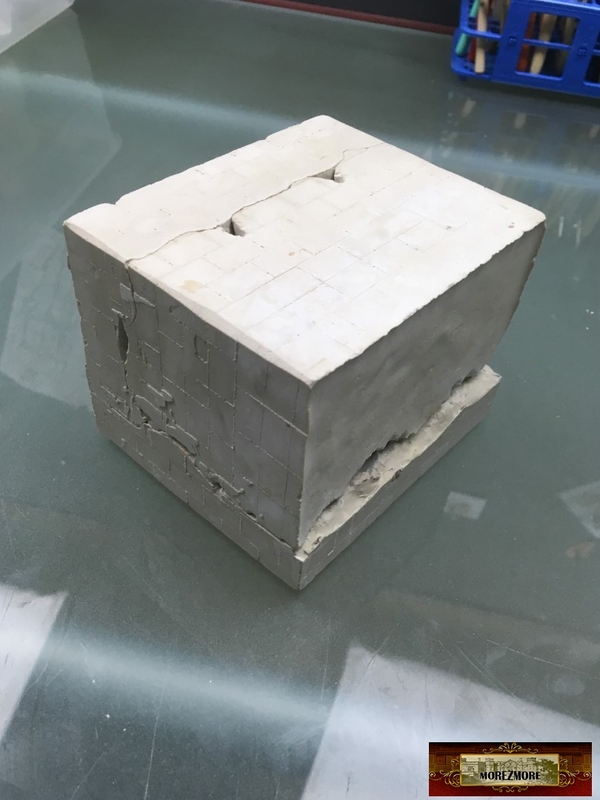 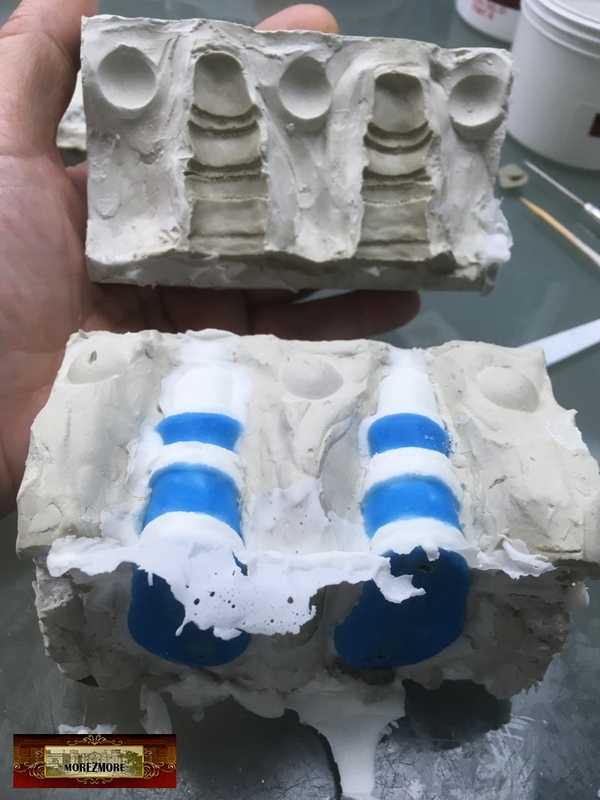 I am going to make a 3-part hard mold, as an experiment. 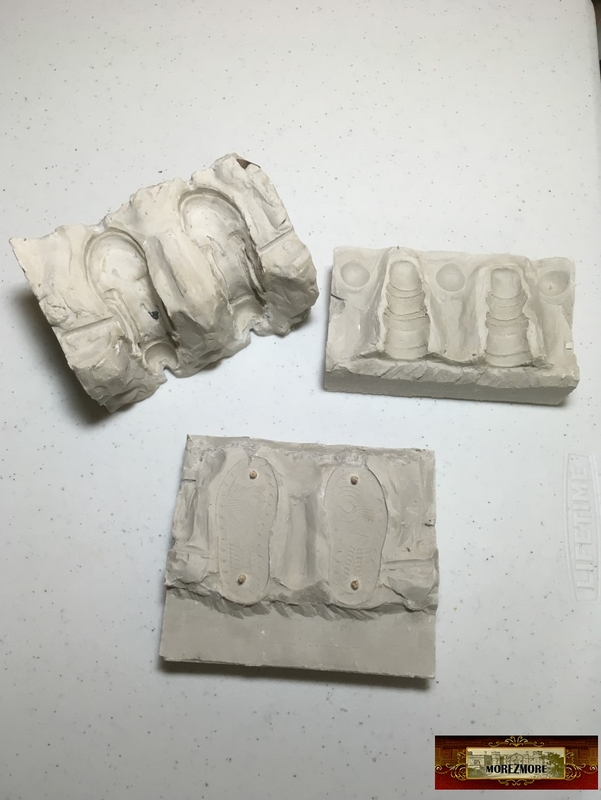 clay roller and blade to make the plastiline mold bed. 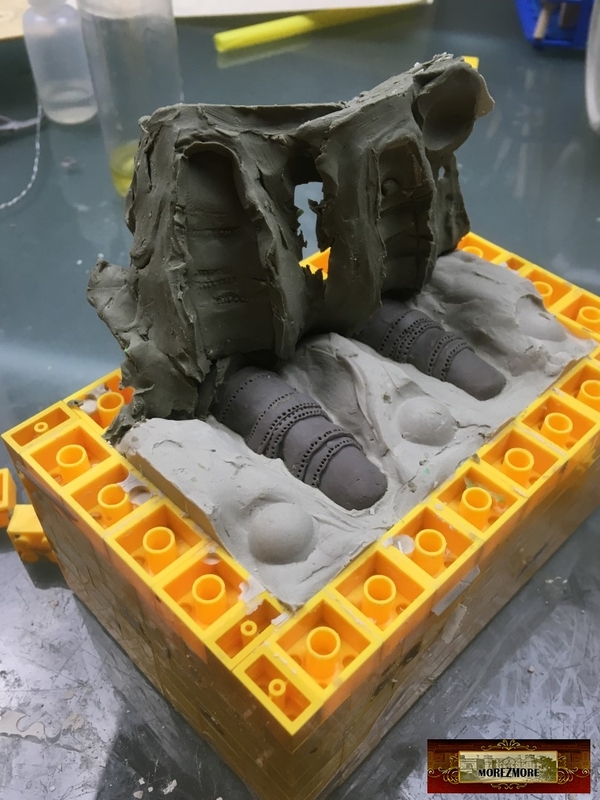 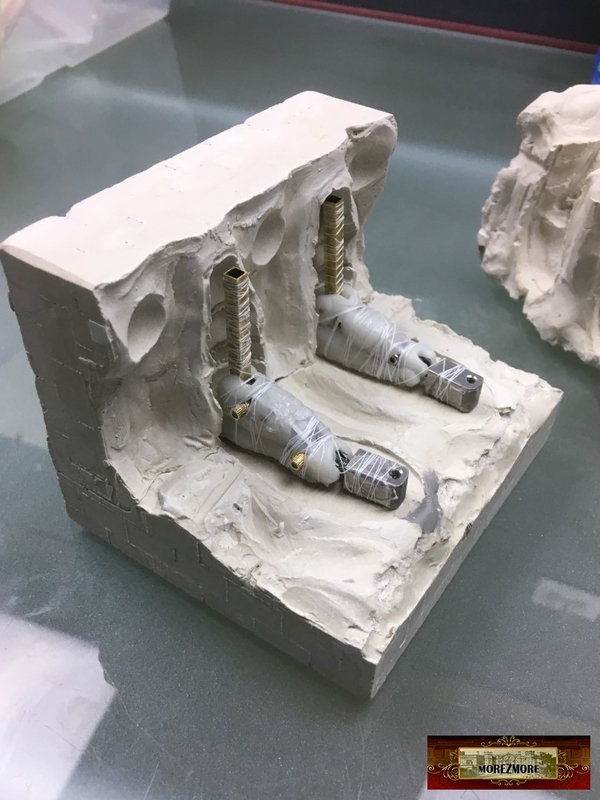 Third part of the mold. 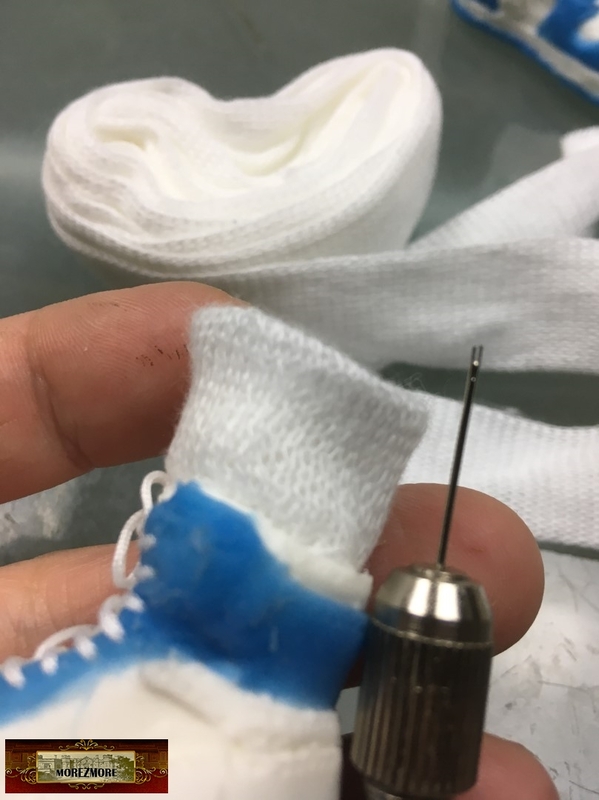 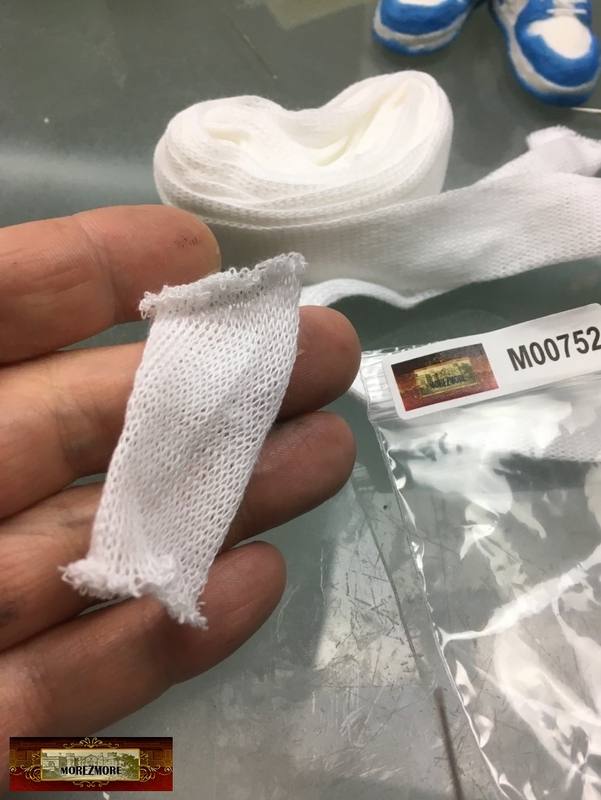 Covered with sewing thread, to make silicone stick. 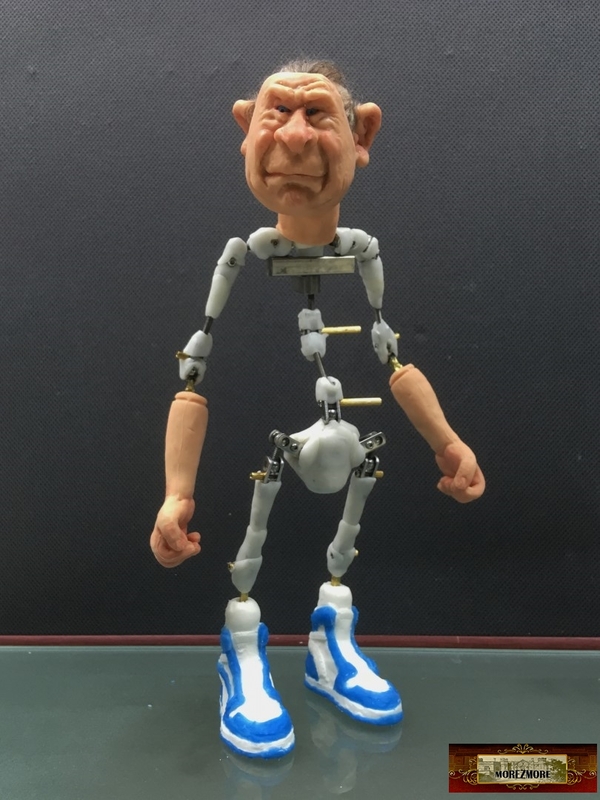 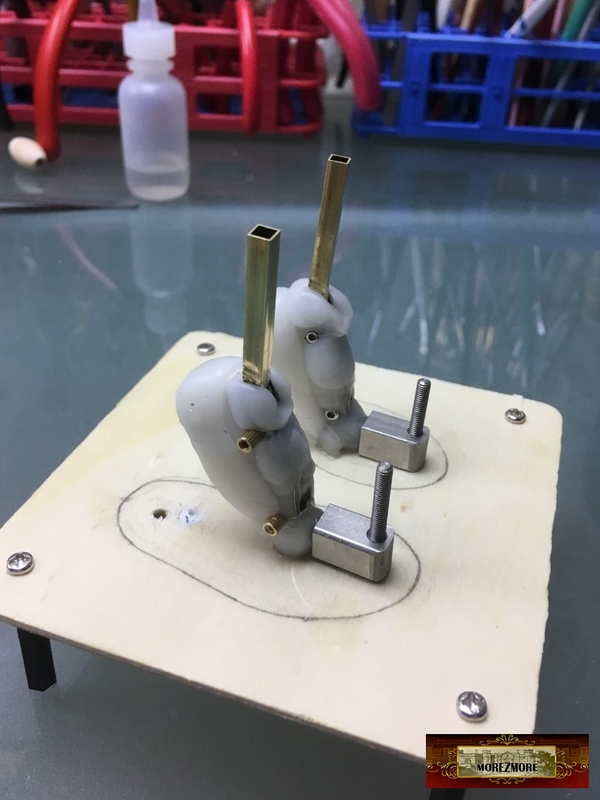 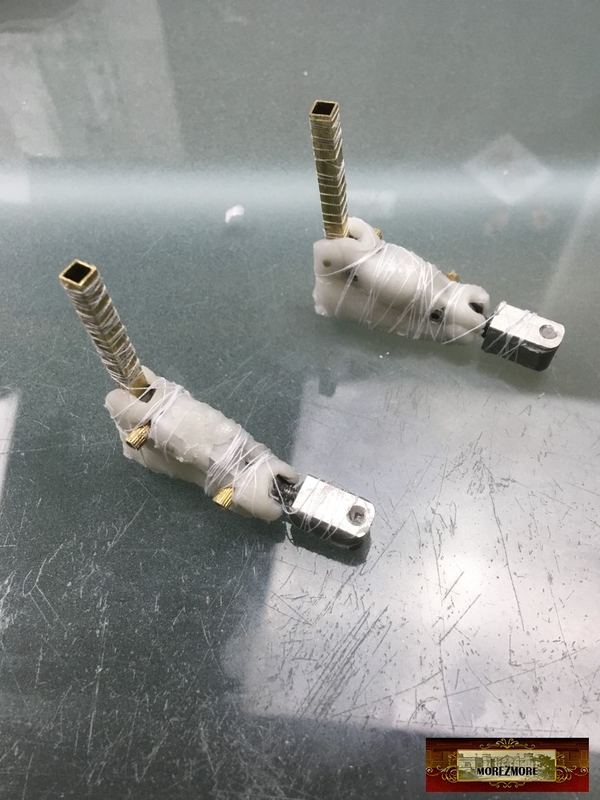 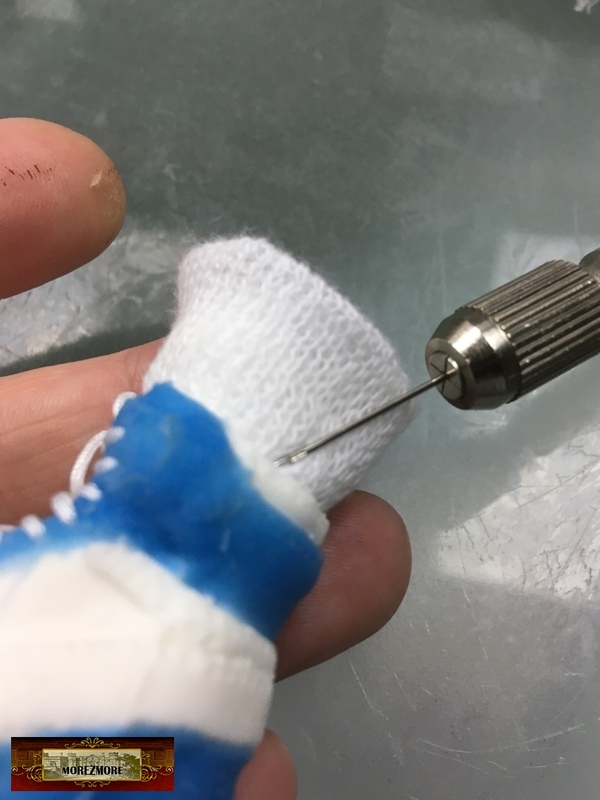 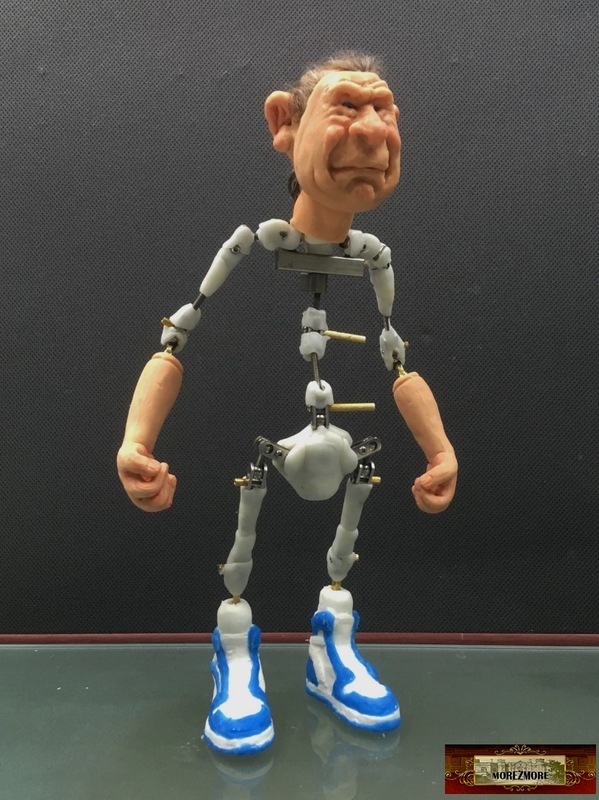 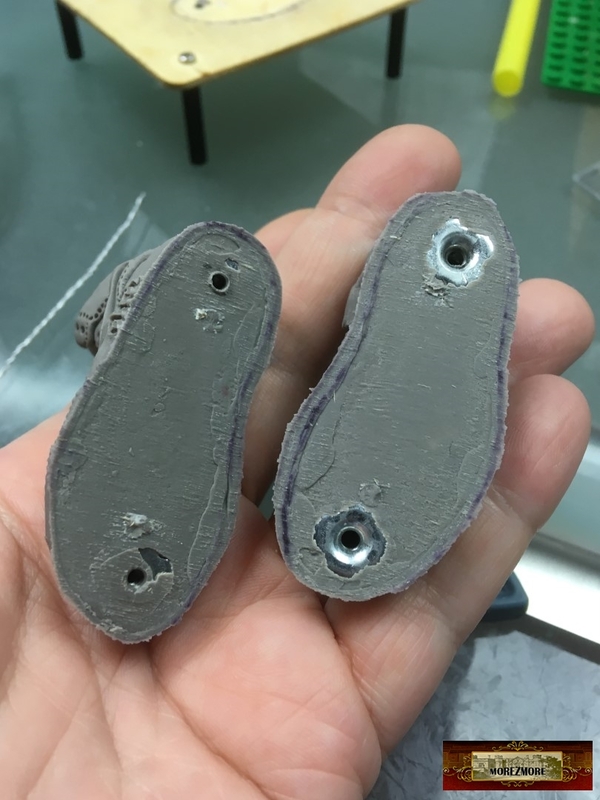 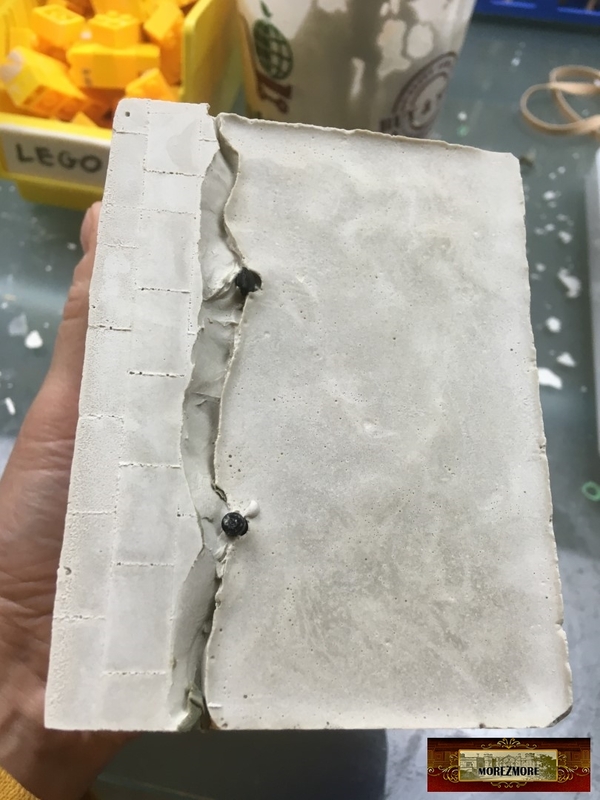 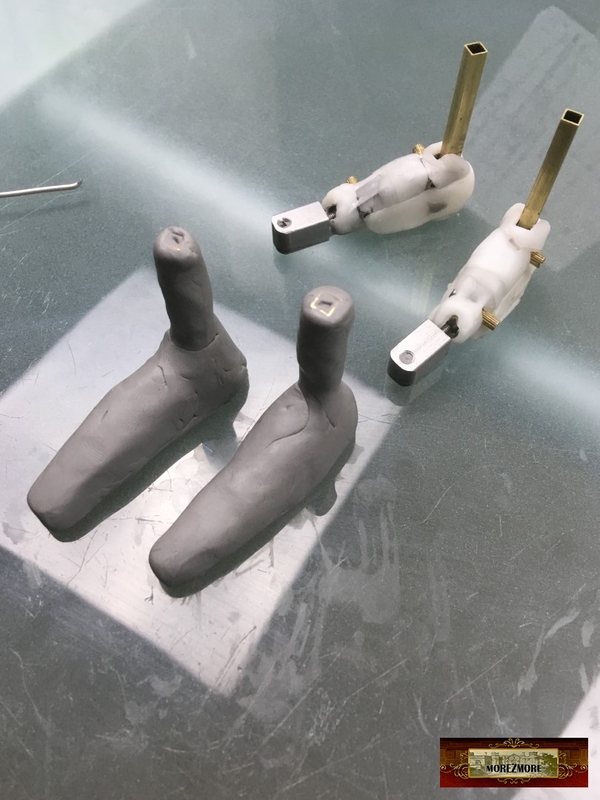 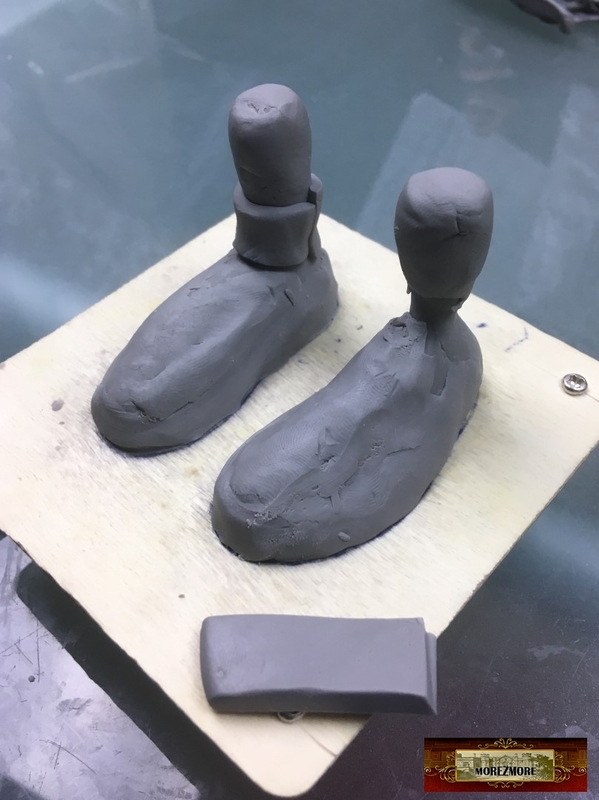 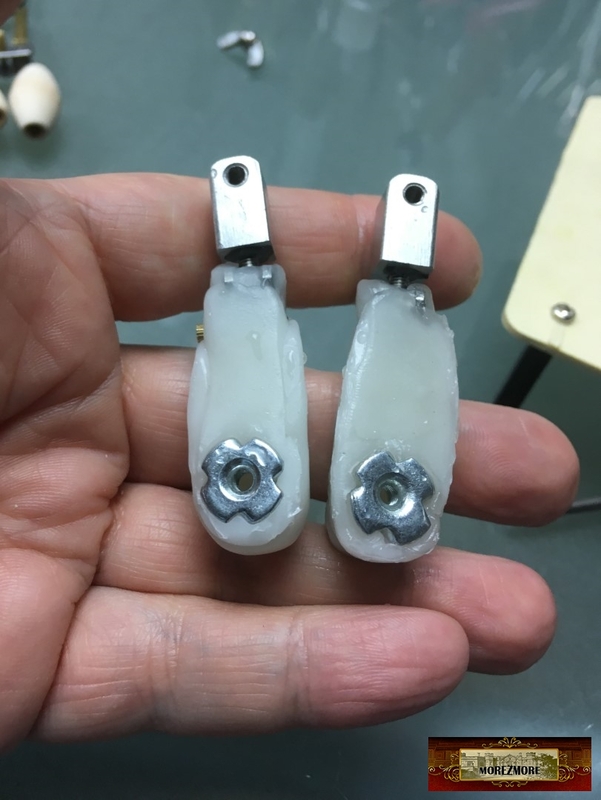 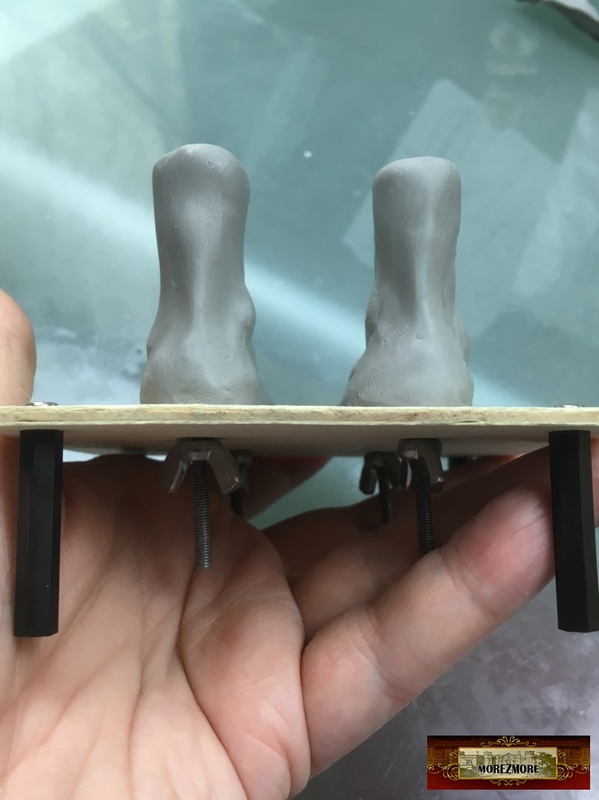 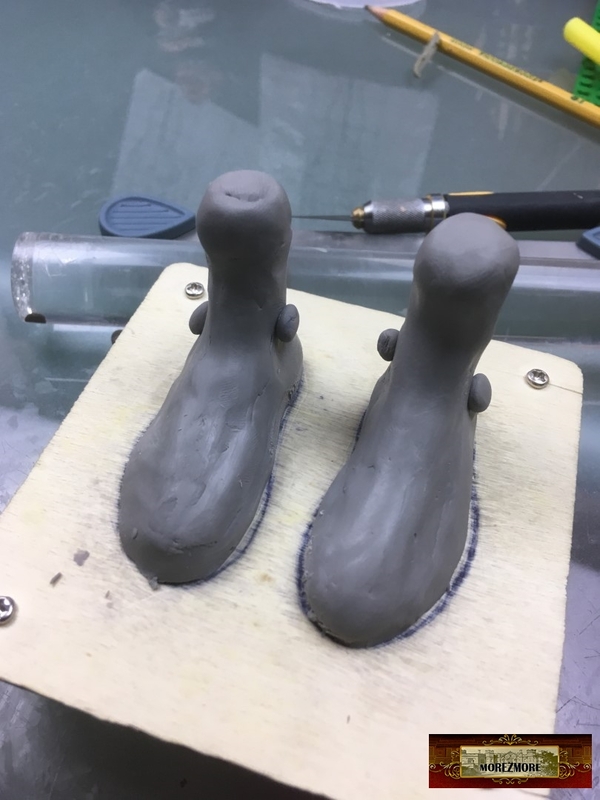 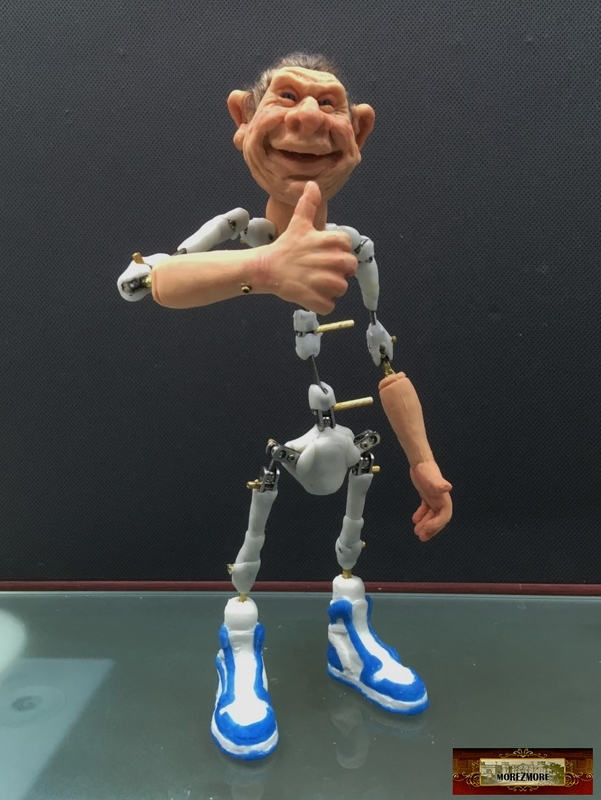 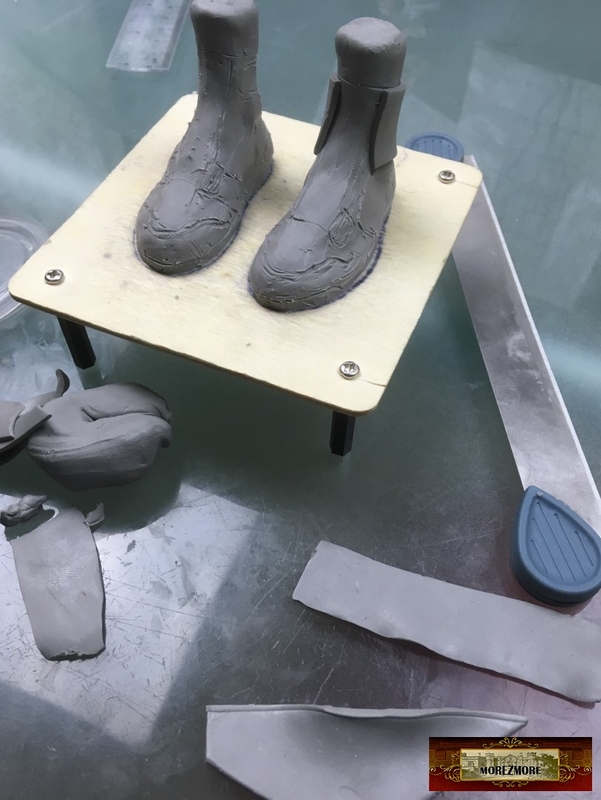 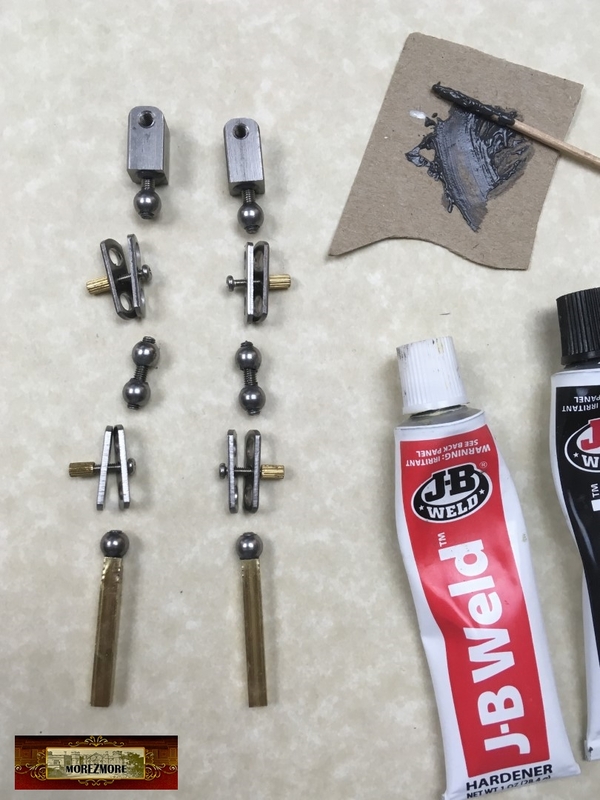 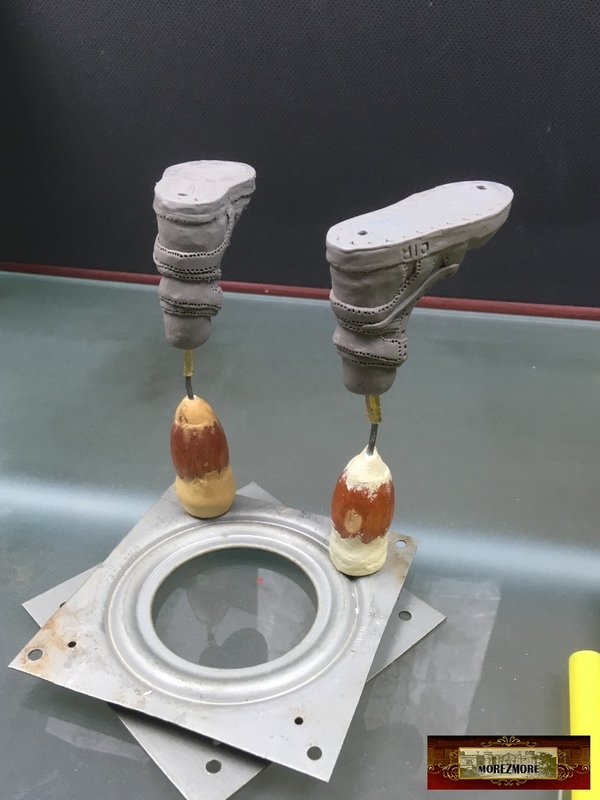 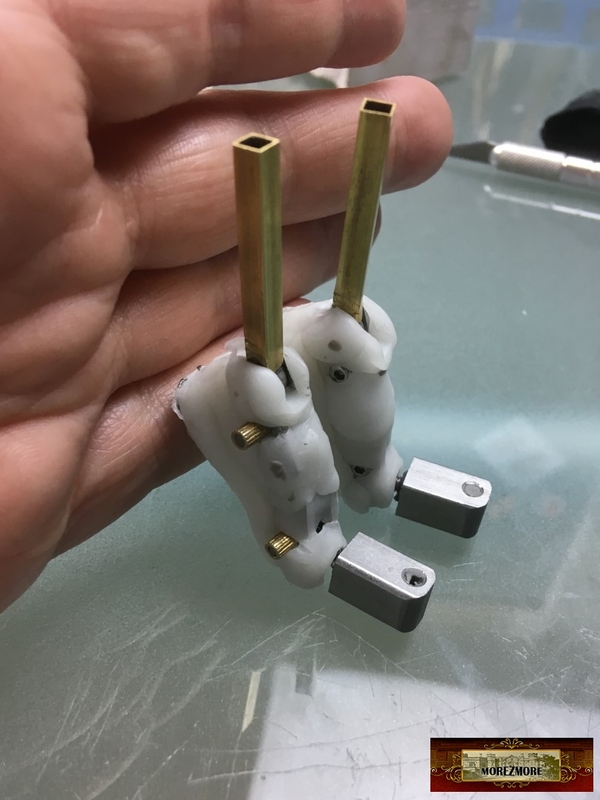 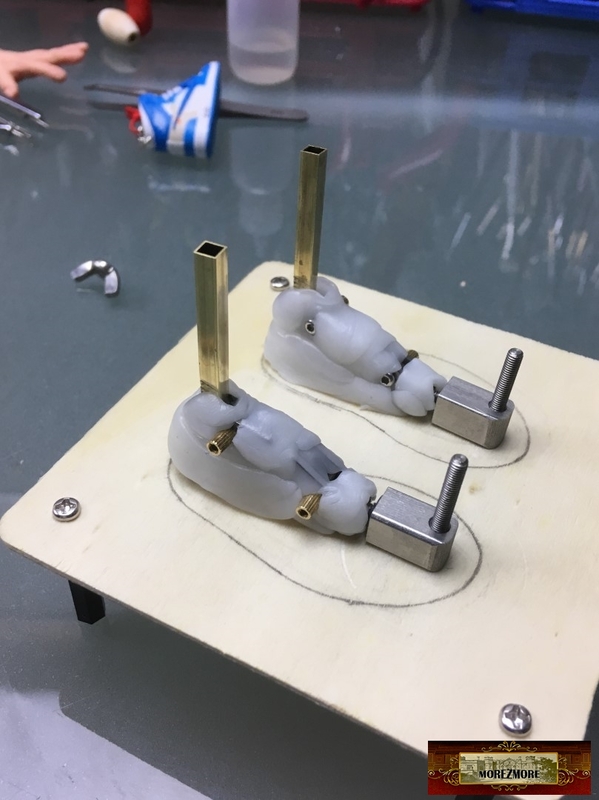 The thread was barely sufficient, I wish I did it the other way – glue the stretch foam with Fabritac on the armature, like I did on silicone hands. 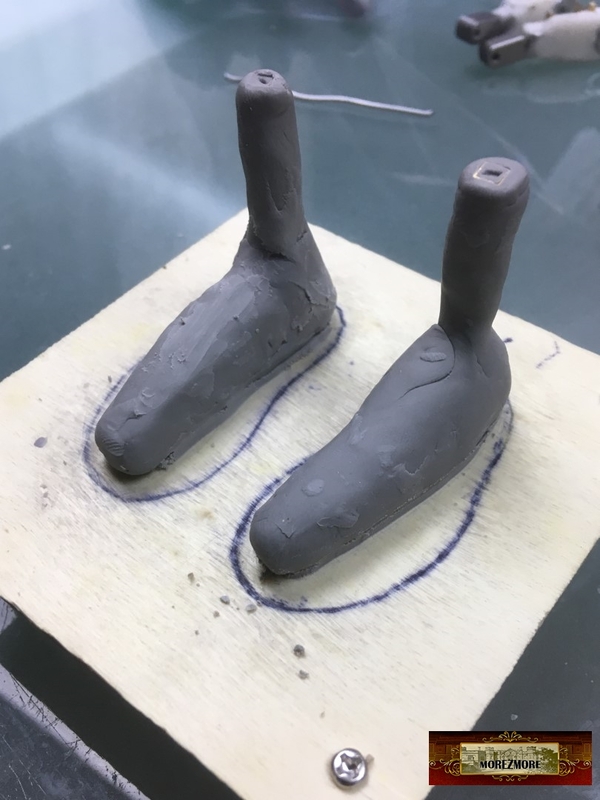 With the thread I can feel the armature move a little bit inside the silicone, stretch foam prevents that completely, because it soaks the silicone and makes it stick to the armature. 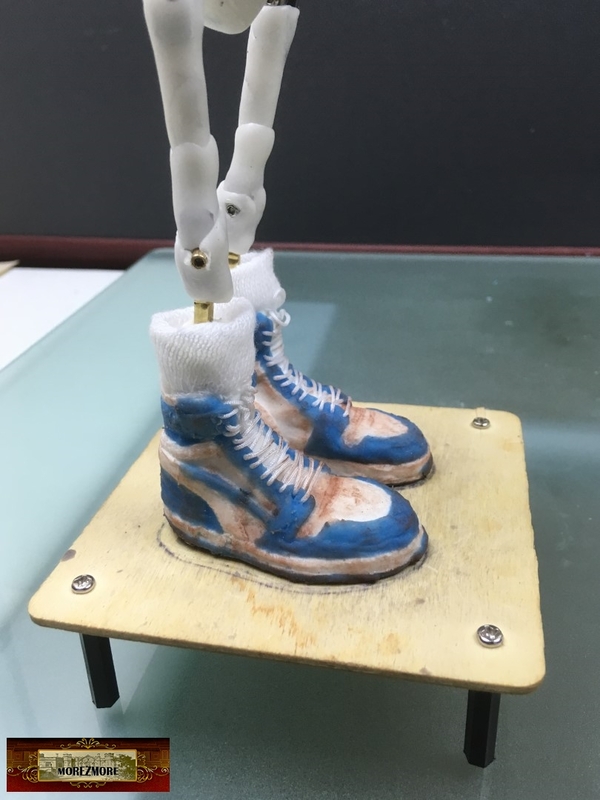 Will remember next time. 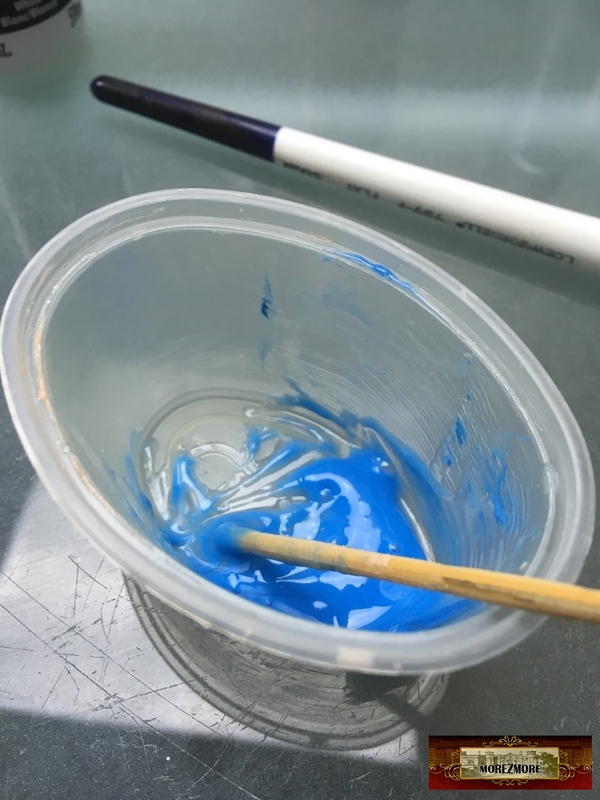 Platsil gel 10 silicone rubber with a bit of blue acrylic paint. 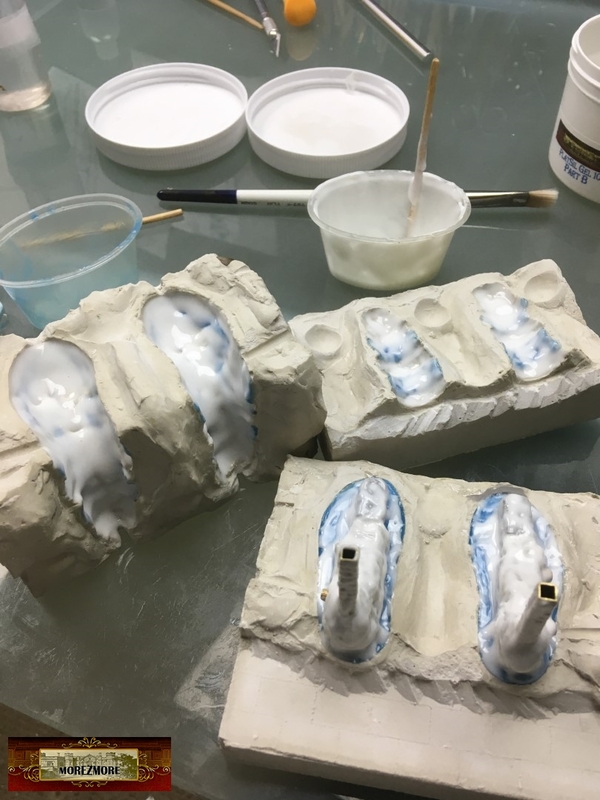 After the blue silicone details are cured, mix Platsil gel 10 with a bit of white acrylic paint. 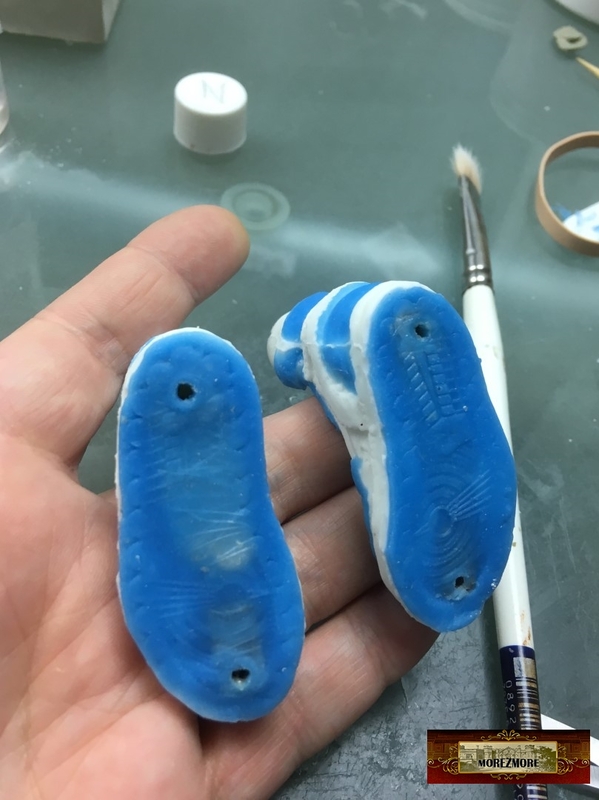 Paint a thin layer first, bubble-free skin. 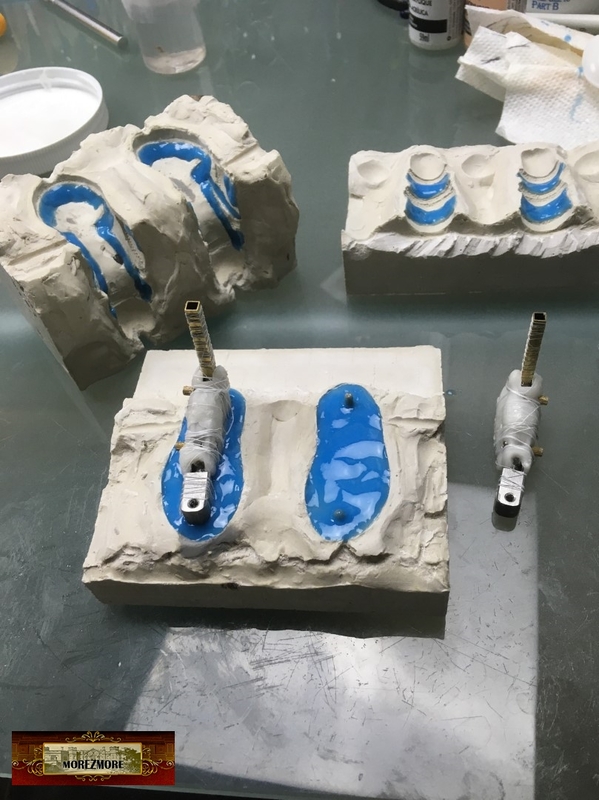 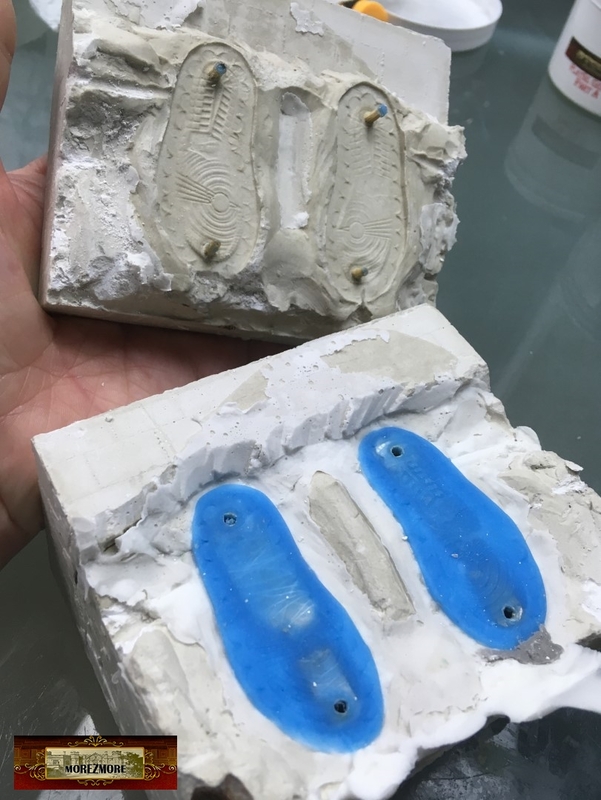 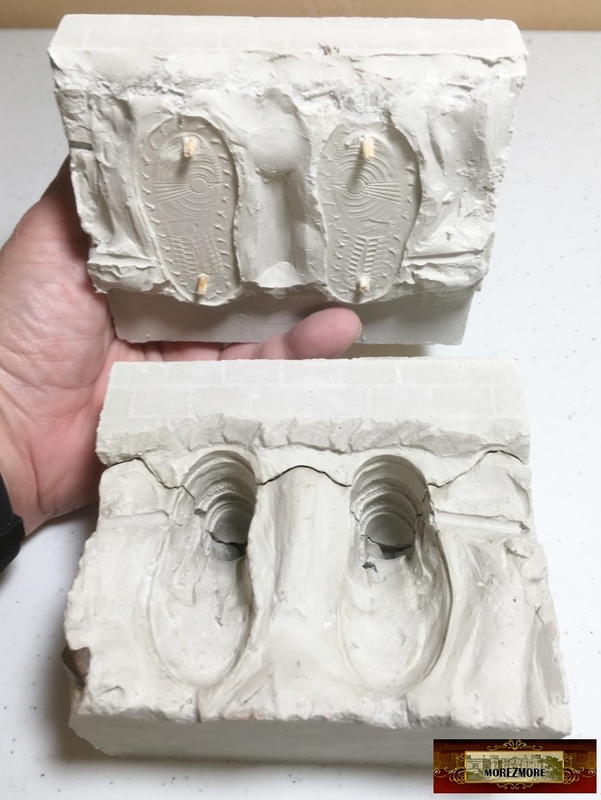 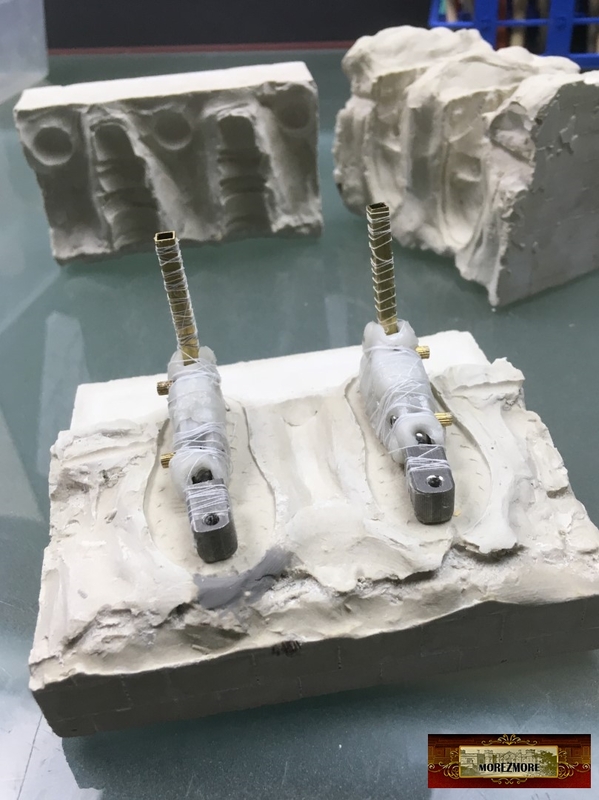 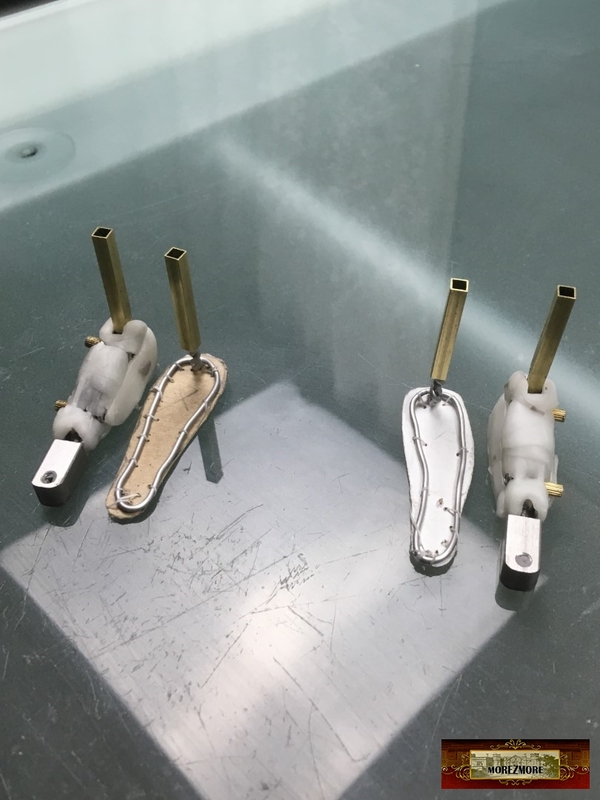 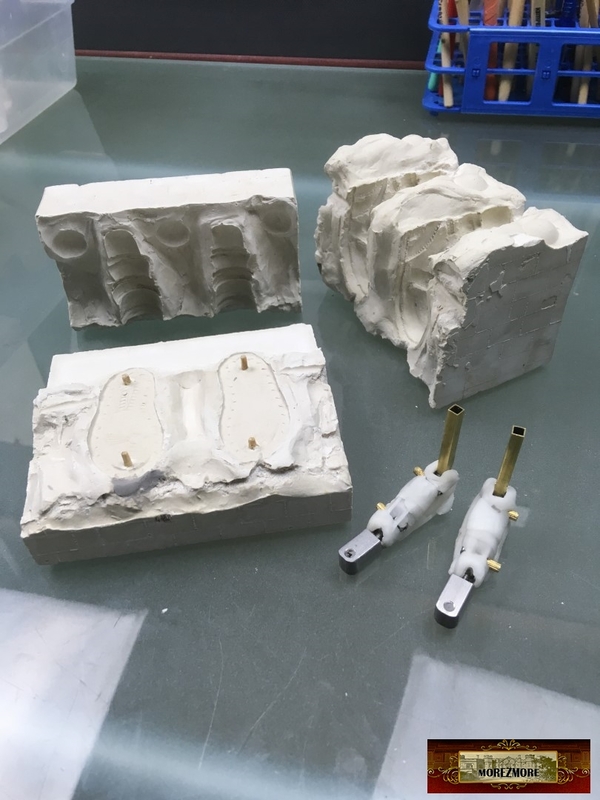 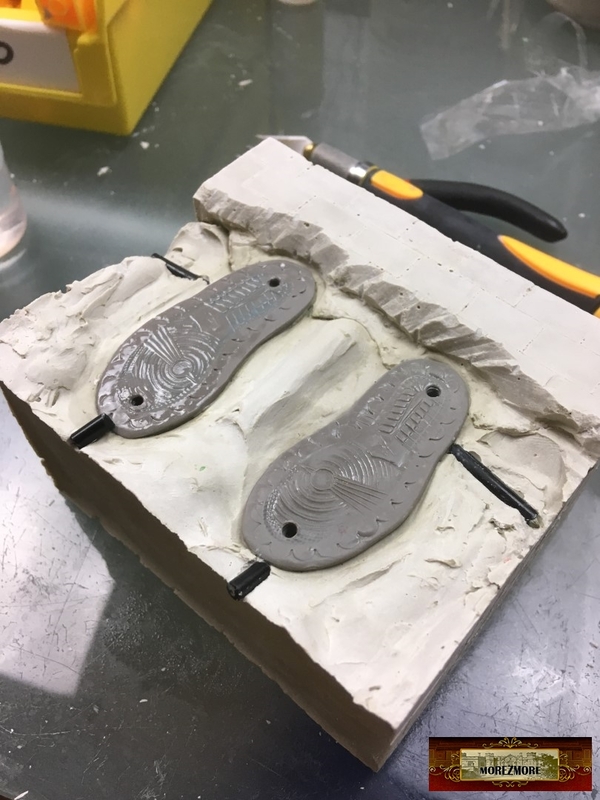 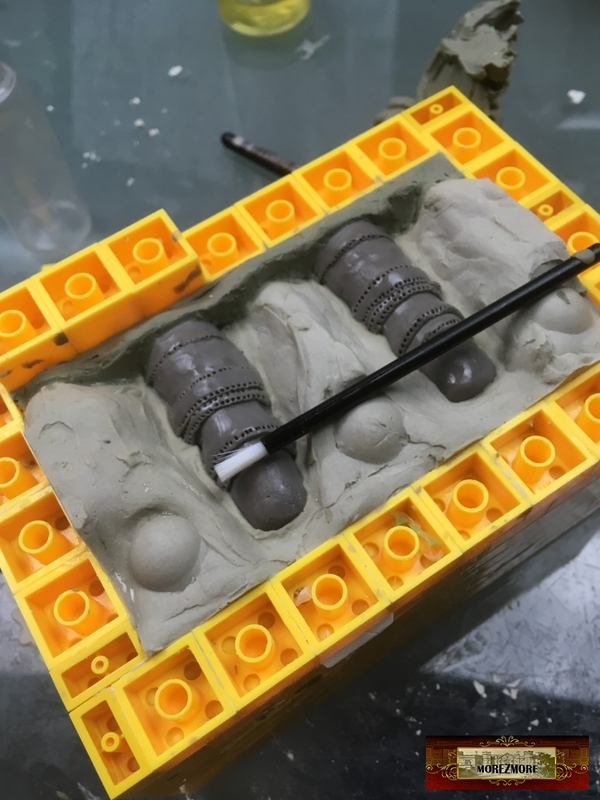 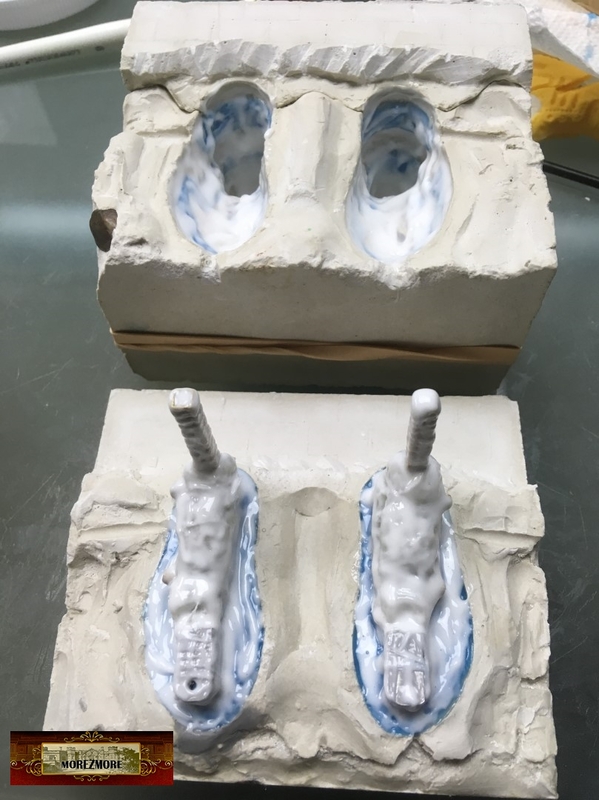 Assembled 2 parts of the mold, tied with rubber bands, filled the cavities with a fresh batch of white-tinted silicone, closed the mold with the 3rd part. 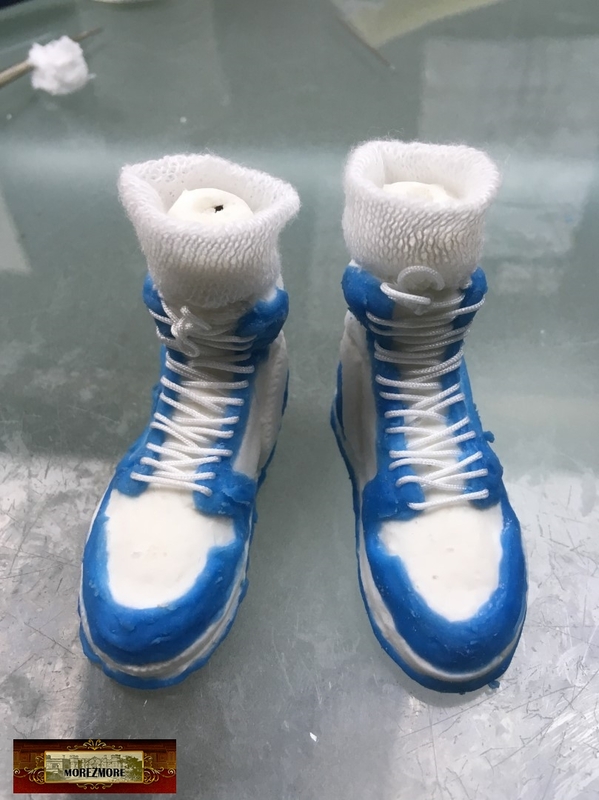 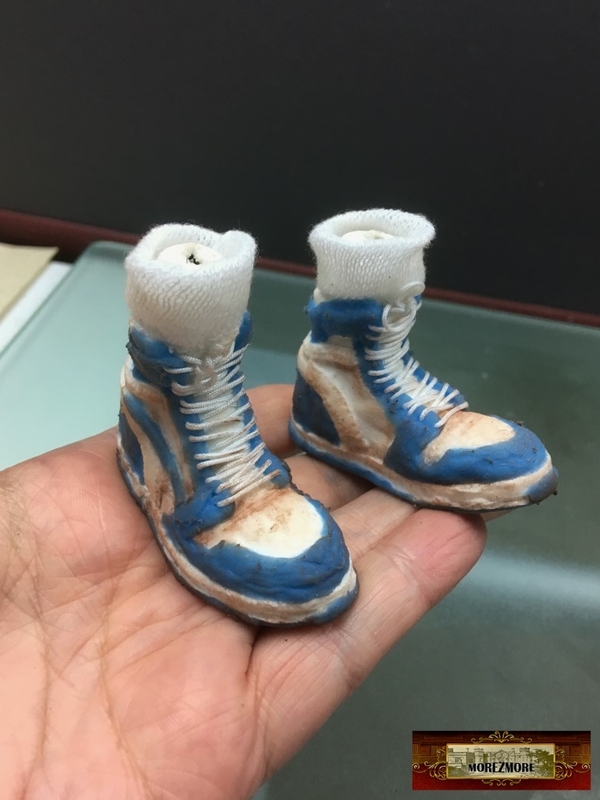 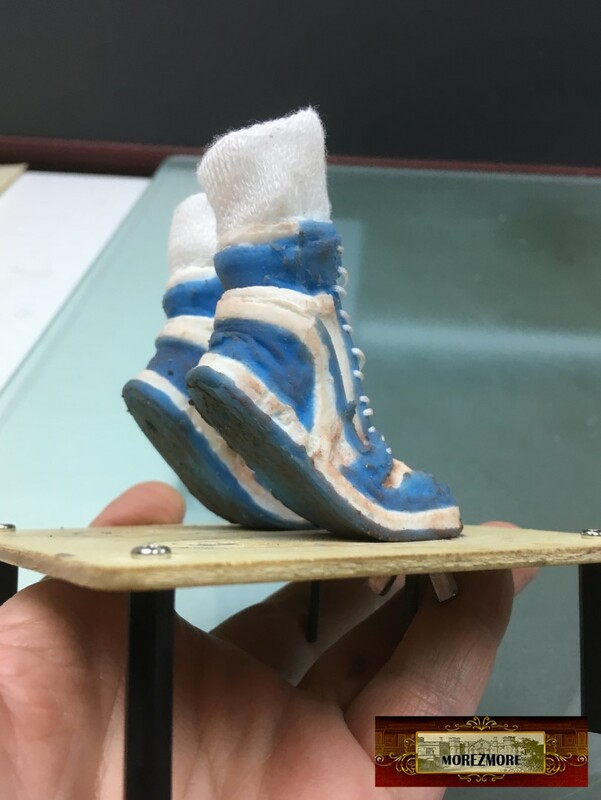 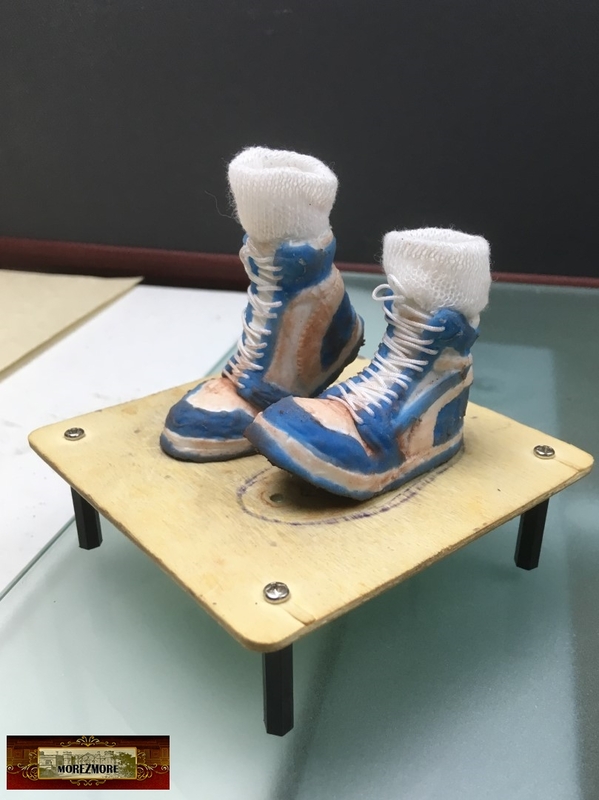 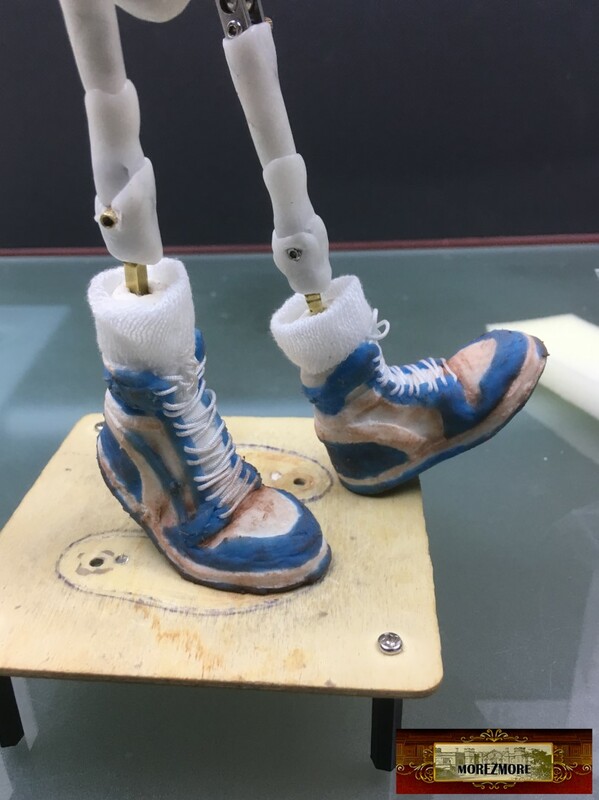 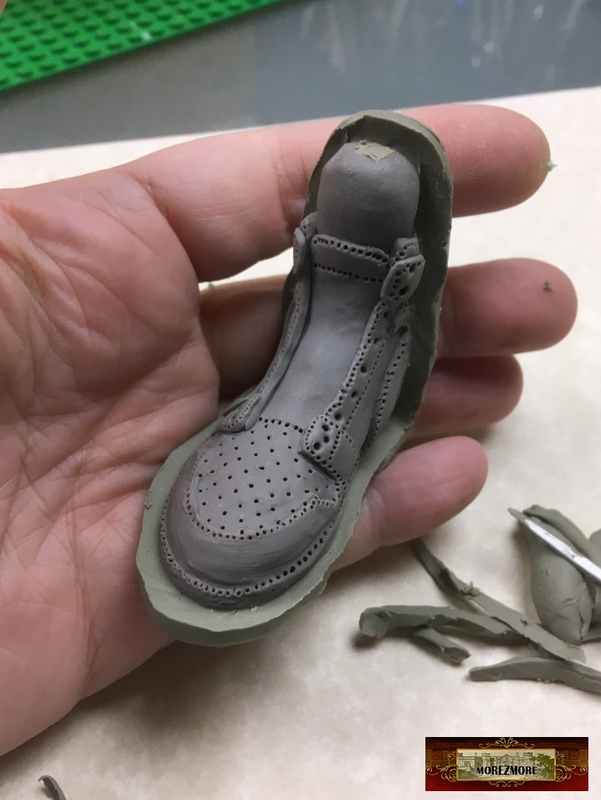 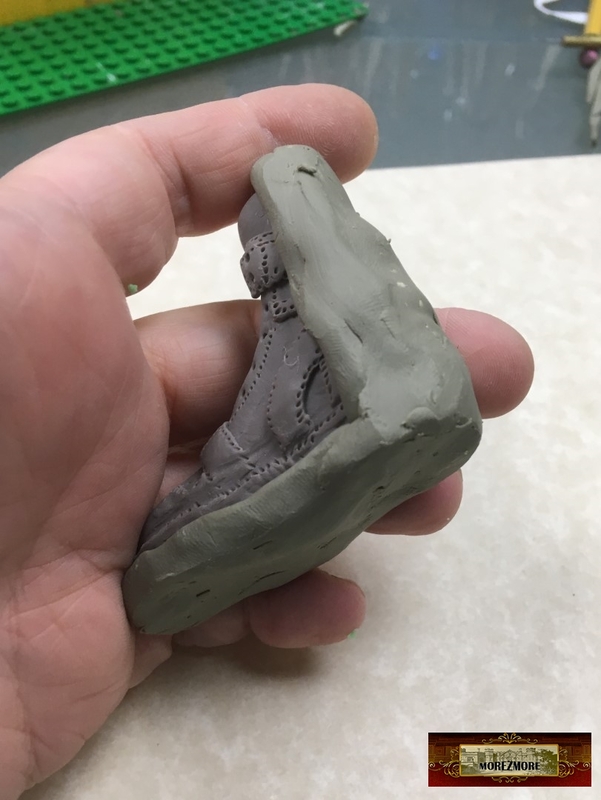 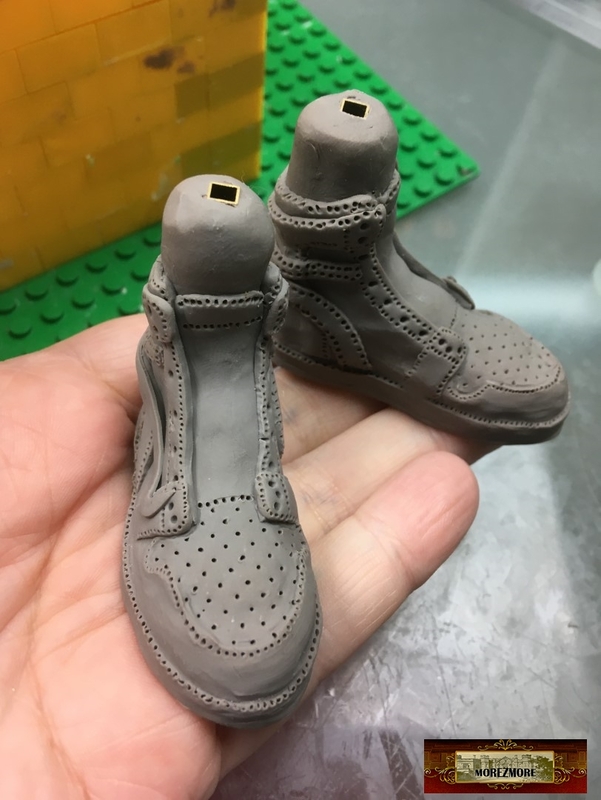 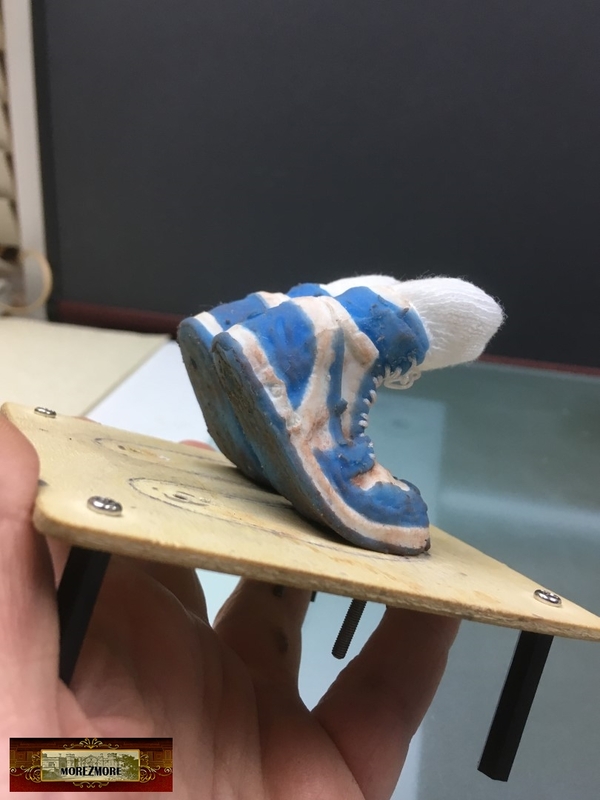 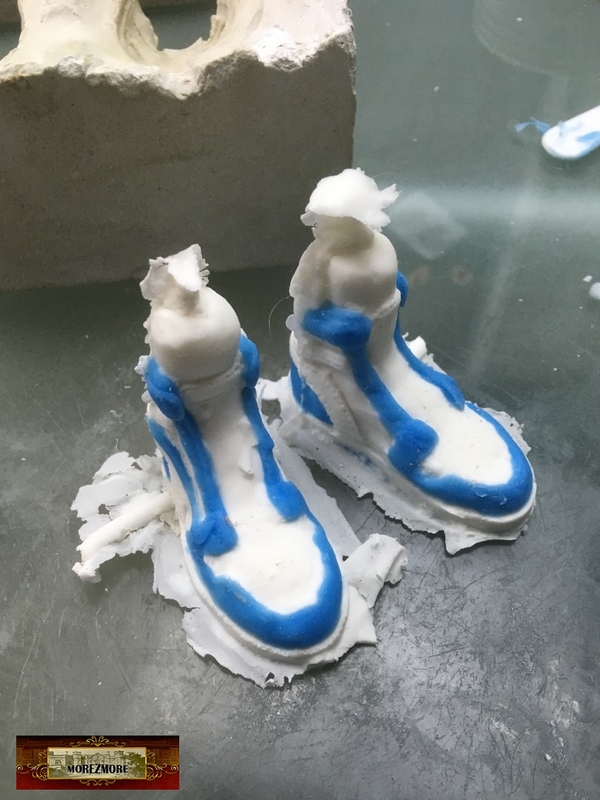 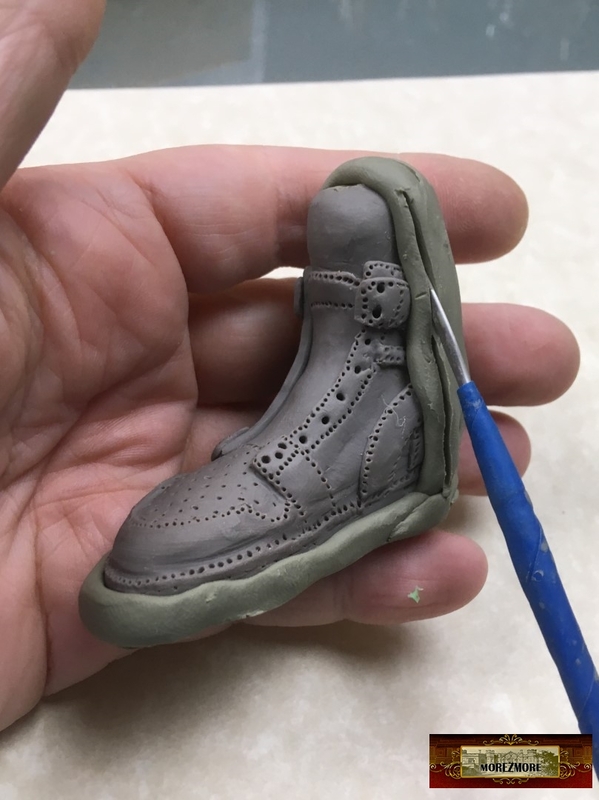 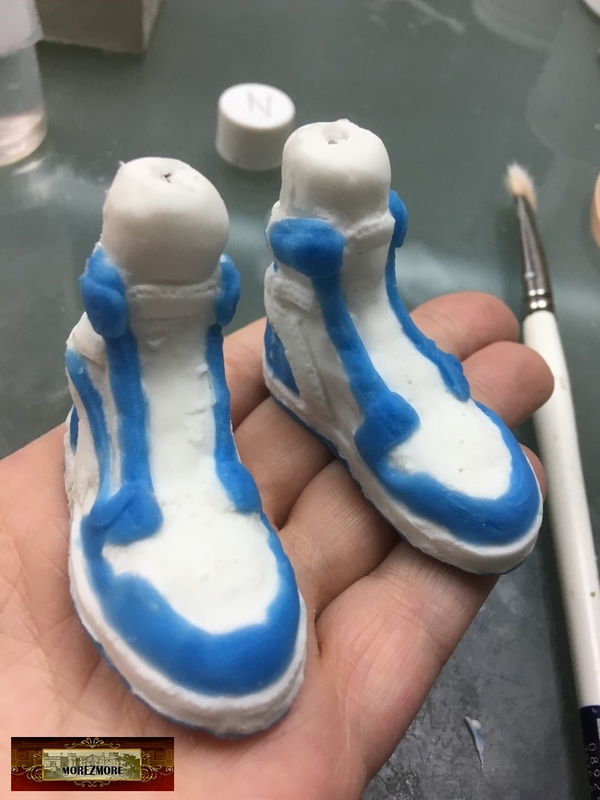 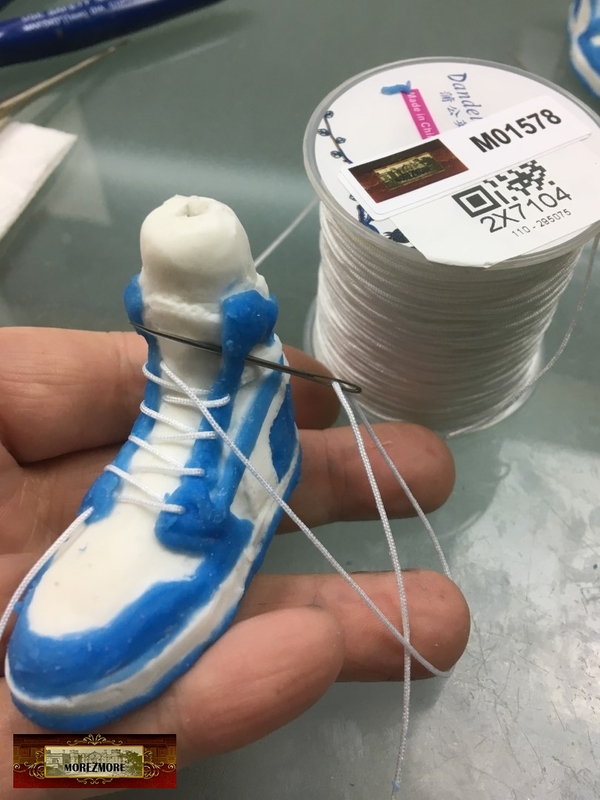 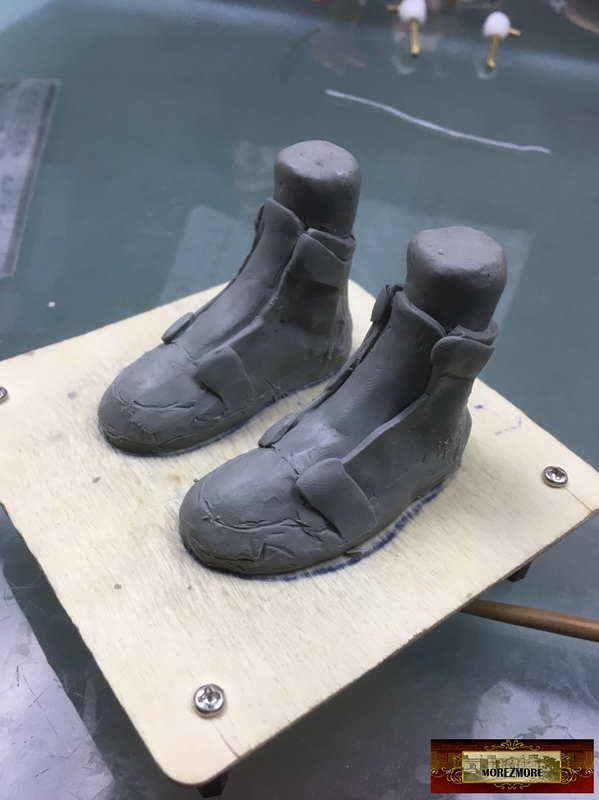 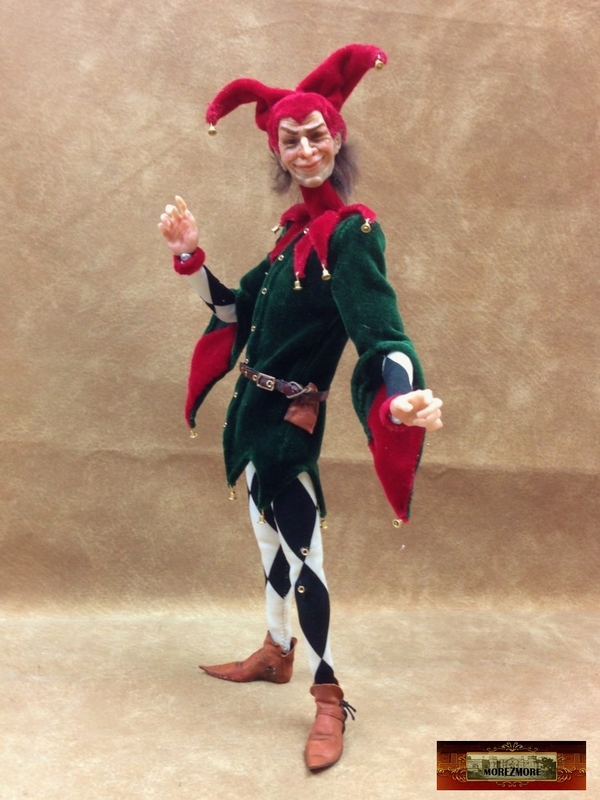 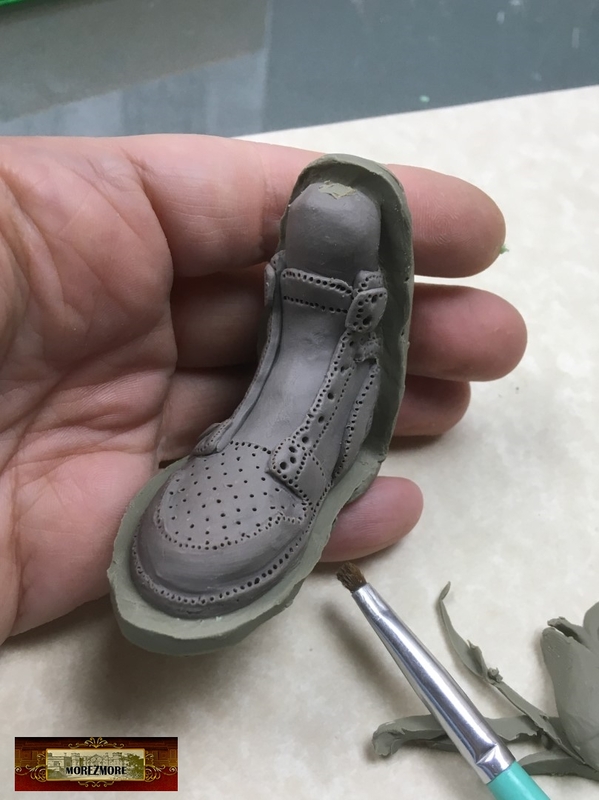 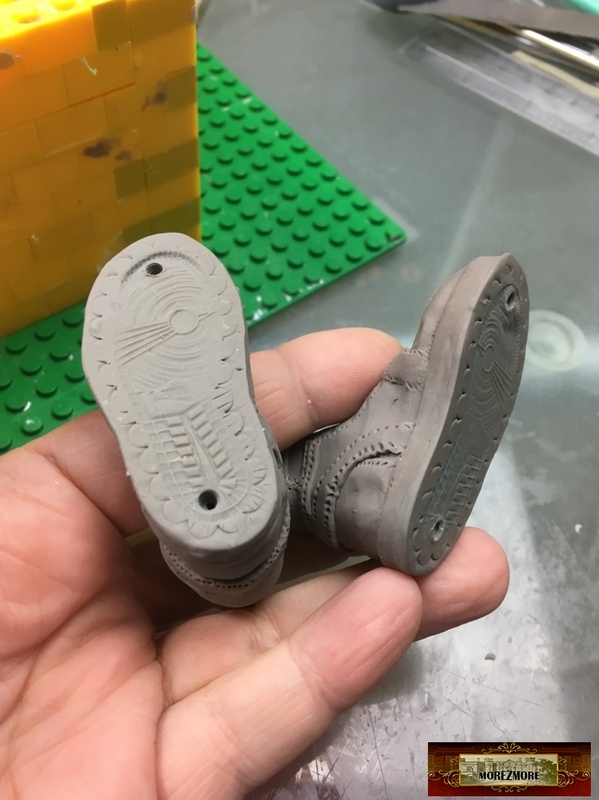 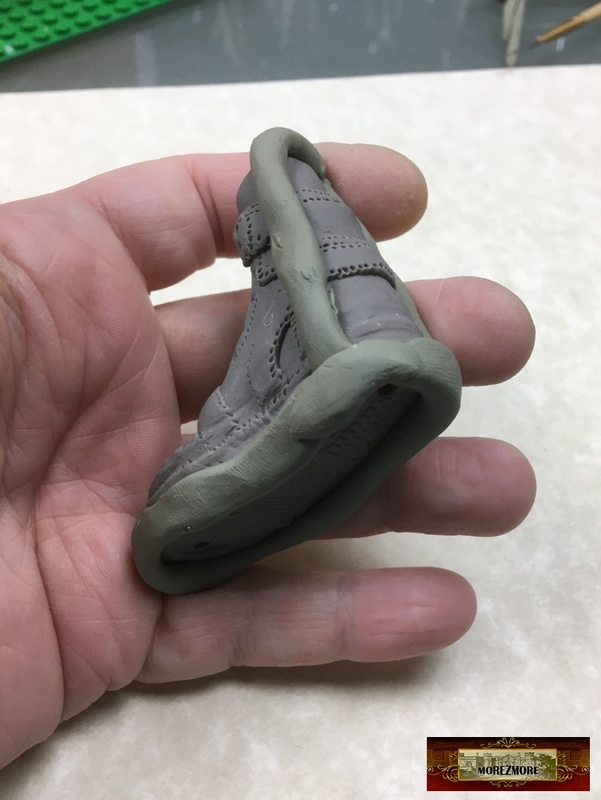 A lot of my tiny sculpted details on the shoes did not work out, but overall it worked. 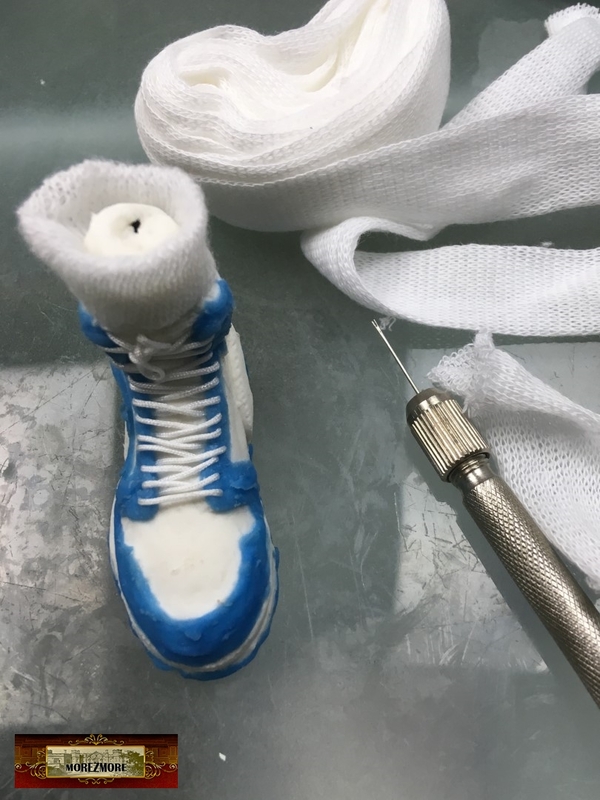 Tucked in with this Hair Tool and sewn in with white thread. 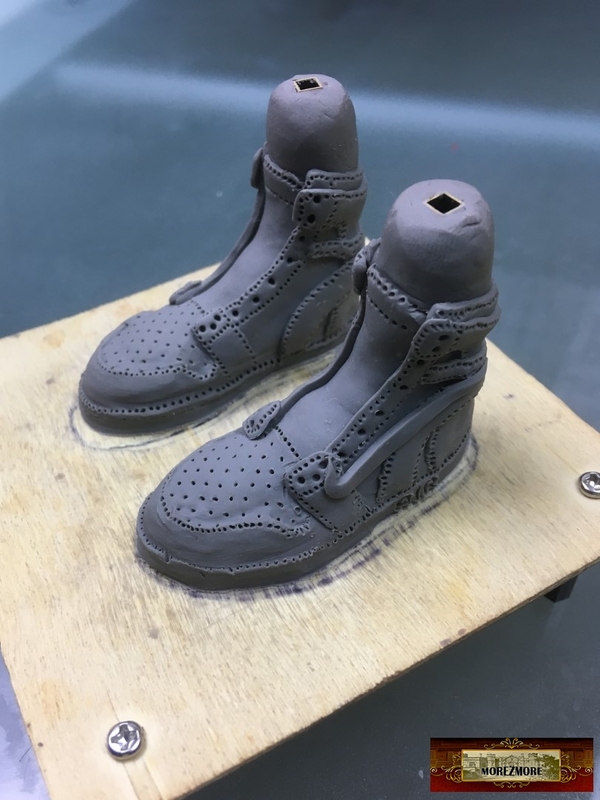 Dust with pastels to make them look dirty.